Our reservation for six was confirmed nine months in advance. What started as a fantastic idea between four friends became a foodies’ mission. The destination: El Bulli restaurant in Spain. Two days before the 2007 season closed, six South Africans arrived for dinner by taxi along a winding coastal road. Billed as the “best” restaurant experience in the world, El Bulli opened for only six months of the year in an out-of-the-way location, so the waiting list was long. 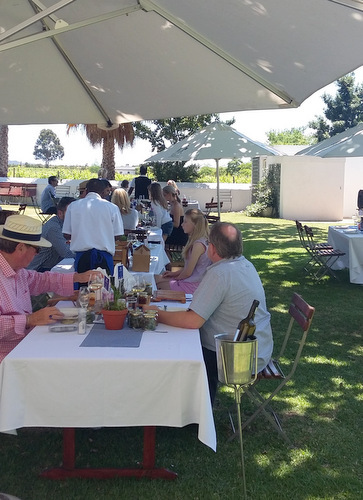 Our table included two Cape Town chefs, two journalists, a winemaker and a skilled hostess/cook. Our common ground: a commitment to adventurous eating and fun. El Bulli’s 32 courses of nibbles, liquids and textures were unlike any recognisable set menu. They arrived as warm foam in martini glasses, as liquid bursting from edible clam enclosures, as pineapple and beetroot snacks on metal stands or as candyfloss-like Parmesan air inside Styrofoam boxes. Waiters’ prompts encouraged sniffing, touching and tasting in a specific number of bites. Visual attention was imperative. The meal was intellectually challenging and witty, yet tasty and light to digest. The Tasting Menu cost €185; the wine prices were incredibly good value for a Michelin-starred restaurant. Q&A: Probing the remarkable mind of chef Ferran Adrià the next day – via a Spanish translator, but he understood most English questions – was inspiring. As with the food prepared, this wasn’t a chef who could easily be pigeon-holed. Kim Maxwell: What is your opinion of the label molecular cuisine, as some describe your food? Ferran: Molecular cuisine does not exist. It’s a lie! I’m asked this question in every interview. Whatever you ate yesterday, the concept was started in 1994 or 1995. So it’s not new or even recent. This label is harmful for me, because people who are anti my cuisine use this term to fight me. 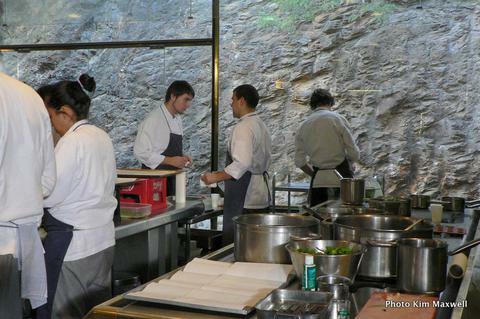 Nobody eating at El Bulli doesn’t know exactly how the food is cooked. What is important instead is the result. 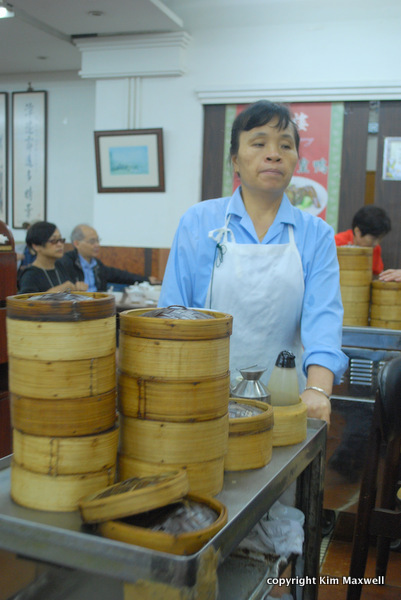 It doesn’t matter if the food is machine-made or hand-made; what matters is that it is there. People always think this type of food is very complicated, but sometimes it’s very simple. Take the oyster leaf I served with the hare jus and red jelly in your meal. People don’t know the leaf so they think it’s from a machine, but it’s only a new European plant tasting like an oyster. Kim Maxwell: Your food is very labour-intensive. Are you saying it isn’t complicated? Ferran: But it is complicated. People see this oyster leaf on their plate and think: what is it? For a chef to eat it, is very complicated, because he will think the chef preparing the dish has gone mad! A normal person could also complicate his life by just thinking about it. Cooking is a language in a way. I’m trying to send a message. Sometimes it’s a message people don’t understand. Then there are those who see more than the food is. It means whatever is in life. I want each diner to have their own experience. Kim Maxwell: London’s Restaurant Magazine panel repeatedly voted El Bulli first of 50 global restaurants. Is it important to be ‘the best’? Ferran: It’s not my objective to be the best. The best does not exist. What is measurable are the influences some chefs have over other chefs. Restaurant Magazine’s list shows these chefs are among those that influence cuisines around the world. It’s very difficult to be the best so I don’t pretend to be the best restaurant or most influential chef. I’ve never worried about being number one; it’s more a consequence of what I’m trying to do. The best recognition comes from people in the same profession, when you’re not included in a list. Kim Maxwell: Doesn’t El Bulli have an unusual format for a restaurant? Ferran: Yes. We are open for only six months, only for dinner. We have 50 cooks in the kitchen, way above the average. So nothing at El Bulli is the norm. We create 140 completely new dishes each year, and use 180 ingredients on our menu. Spanish journalists use me as model, as a temperature gauge. They’ve asked other Spanish chefs the same questions, and realised that other restaurants can’t do it … all our new dishes, our format. Your menu for six was created for your table. They ask how we can structure a restaurant business model this way. The answer? El Bulli is not a restaurant in the usual sense because it’s not structured as a business. It is a place where a creative team looks for the limits in cuisine. We use a known format that fits into usual restaurant traditions, so there is connection and feedback to the world and to the team. But we would like to be more radical in future. This El Bulli format could be transformed into a restaurant table open only every 15 days. Why shouldn’t it be? You need to understand this or you don’t understand El Bulli. Kim Maxwell: How does the menu creation process happen? Ferran: Talent is not something you can structure. I have the best creative team in the world. I couldn’t do it alone. From 1994 to 1997 I was alone here. But now the El Bulli standard is so high. We close the restaurant at the end of September. On the following Monday my creative team and I pack our bags for London, Paris and perhaps Chicago, to search for creative ideas. The team of five includes my brother and me. We visit museums, markets, Chinatown, or spend time in bars, talking and brainstorming. We are looking for the meaning of happiness in our food. Kim Maxwell: I noted Asian ingredients in my 2007 menu: imitation caviar made of miso, teriyaki mackerel belly, miso sesame sponge cake and shimeji mushrooms. Was the Asian focus intentional? Ferran: I used 180 ingredients in your menu, of which only eight were Asian. Your razor clam dish with seaweeds had 10 ingredients alone. Maybe Asian ingredients are more noticeable because they are less usual. We use a lot of Spanish dishes and ingredients from the Roses area too — we used pistachios from Tarragona nearby. Do you know what was missing on your menu? Bread! For a European diner, to have no bread during the meal is unimaginable. So I included black sesame bread crumbs in the mackerel dish. Kim Maxwell: What inspires you to travel? Ferran: I visit places for cooking promotions if I think I can learn something there. But if I travel with my wife, it’s very different to travelling with my team. What impressed me after visiting Japan is the greater respect Asians, and the Japanese in particular, have for a dish. 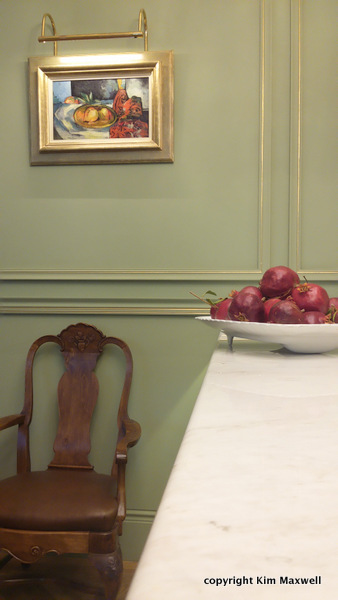 Also, the way dining rooms are set out. 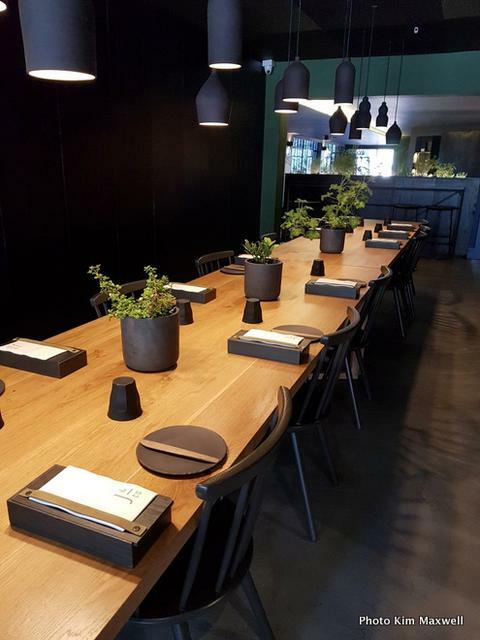 El Bulli’s dining room isn’t very suitable as it’s too sociable for eating as an individual experience. Kim Maxwell: What constitutes an ideal eating experience? Ferran: I was involved with Dokumenta, a contemporary art festival, during 2007, where two mystery guests were sent for dinner at El Bulli over 100 days. These weren’t foodies, but art people. One of them sent me the most wonderful sentence about her experience. “I went out of El Bulli with a sensation of not having eaten anything dead,” she said. Eating is a very individual experience, so this situation confirmed to me that two diners are the ideal number. In special cases, a group of four or six can work if people are concentrating as professionals. But an experience for two is preferred so as not to loose concentration, as people eat at different speeds at larger tables. 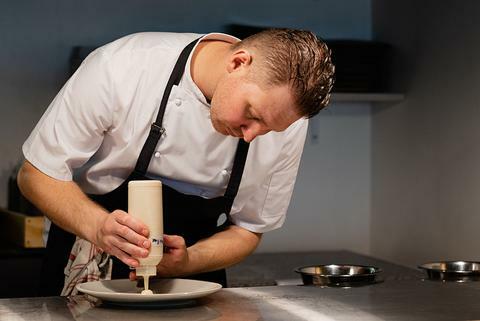 Concentration on a dish is based around the senses – it’s very important. People don’t use their senses enough when in a restaurant with friends. My ideal at El Bulli would be 20 minutes per dish, but with 32 courses it is not possible. 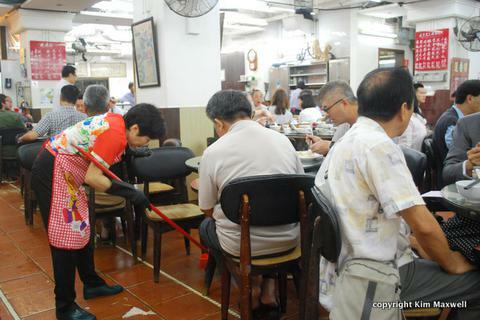 The speed of dishes arriving is fast so the information is concentrated. 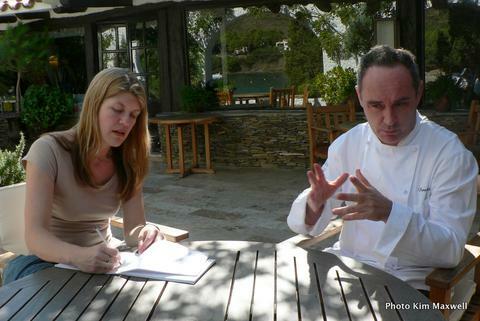 If El Bulli’s creative team of five travels, we eat and study with concentration, and analyse. But this is not normal behaviour! Kim Maxwell: It’s hard to fathom your intention with some dishes, the Parmesan air in Styrofoam, for instance. Is cooking a language everyone can speak? Ferran: There could be 1000 different meanings, depending on the person opening that Styrofoam box. You could think about 15g of Parmesan air which is very light, but eating it provides the sensation of being heavy. It could be pop art if you were an artist, or similar to a box found in a supermarket. To speak my language of cooking, you have to go through all the steps to understand it. But others who know less can still enjoy it. You don’t always understand a poem, but you can enjoy it. It’s the same with eating. Kim Maxwell: Could you create the El Bulli experience outside Roses, Spain? Ferran: I could and I couldn’t. Whatever I can change, I change. What I can’t, I don’t. What’s more important is the format. If I take that format of operating a restaurant every 15 days, I could do this in Roses or in Barcelona. But doing it somewhere else, the food would be different. EL BULLI, Cala Montjoi, Roses, Spain. The restaurant closed permanently in 2011. Somerset West dining has just got more exciting. 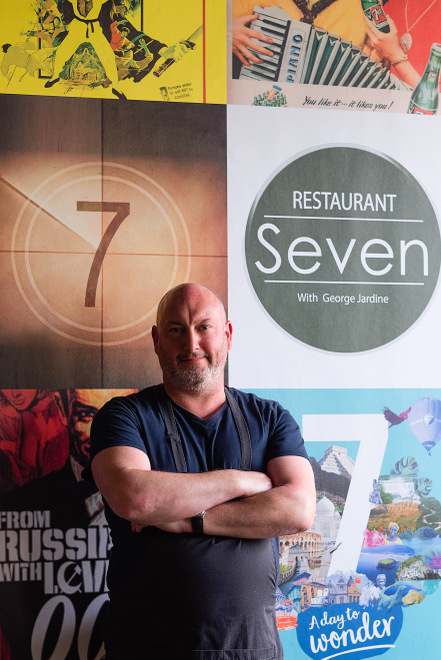 New Restaurant Seven with George Jardine is upping the ante for quality smart casual dining, just off the main street. 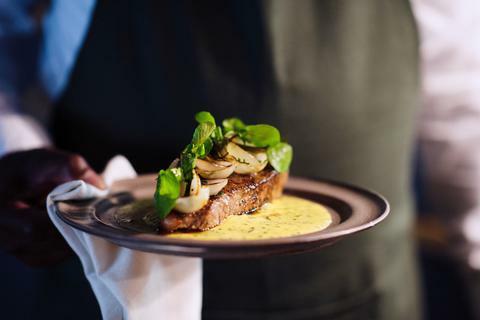 “This is a restaurant for young professionals from Somerset West, who don’t mind spending R20 more if they know they’re getting a superior product,” says Scottish chef-owner George Jardine. Open for lunch and dinner in shop seven of a small upmarket shopping centre, it has a wine bar and a florist as tenant neighbours. 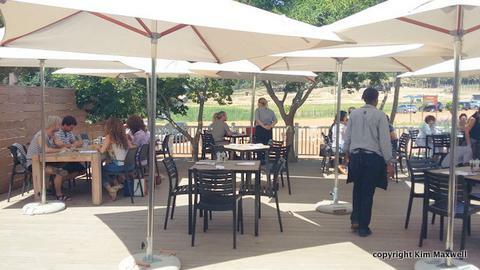 Previously, Somerset West locals made up about 50% of the clientele at Jardine’s two other Stellenbosch restaurants. Now they don’t need to travel to eat well. 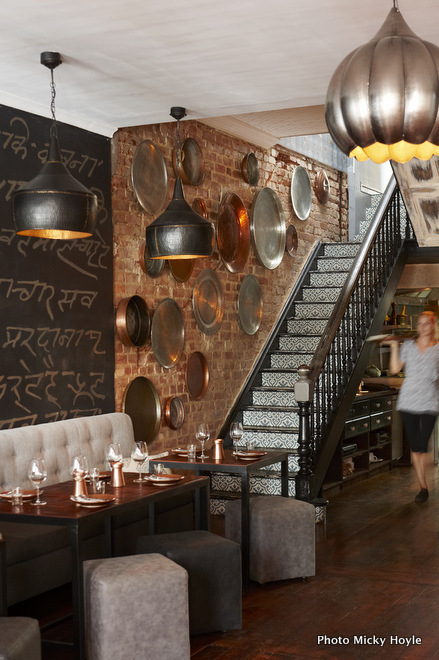 Jardine and Le Riche sourced most of the restaurant décor elements themselves. The open kitchen and the entrance area show off eyecatching wallpaper customised to the numeric theme, using favoured film, advertising and book icons. These include a 7 Up soft drink, agent 007’s From Russia with Love, to Enid Blyton’s book Secret Seven and Yul Brynner starring in sixties Western The Magnificent Seven. 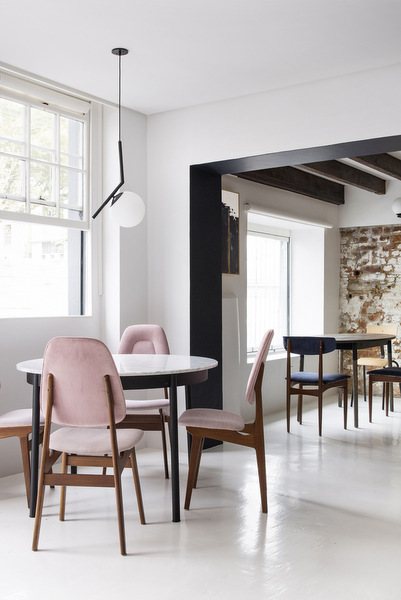 Unstained tables and chairs in ash wood were crafted by Somerset West furniture designer Louw Roets. Dirty olive or tan leather is used for the seats. The lighter wood contrasts the restaurant’s walls in dirty green, and yellow with a teabag stain. The long dining space is framed by a charcoal ceiling. Charcoal banquette seating, upholstered in textured green fabric, cleverly double as storage units. Spare a moment to admire the floor. The former tenant was a laundry with unsightly square vinyl tiles, but now an epoxy coating has transformed worn vinyl indents into an arresting contemporary surface. The single-page menu seems deceptively uncomplicated, hiding the skill and input that goes into making proper stocks and sauces. Take the artisanal brioche toast partnering bone marrow richness with earthy mushroom duxelles in stocky jus. Or the steak, partnered with unctuous béarnaise and shallots currently, but perhaps a bourguignon or pepper sauce in future renditions. As starter options there are signature Saldanha oysters, served with a Bloody Mary and celery splash. Or perhaps, an outstanding prawn boudin blanc starter using pressed, crumbed prawn and hake, resting on an intense prawn bisque pool of salty intensity, with crushed broad beans and pea puree. “Going into summer we’ll see more things such as the green gazpacho,” says Thorncroft. This delicious chilled soup is a vibrant mix of steamed leek and zucchini with a broad bean, diced avo and cucumber base. Served with Buffalo milk labneh, it’s finished with toasted almond nibs. Even non vegetarians will enjoy the roasted celeriac dish with silky celeriac velouté, perky hazelnut crust and prune butter. Salad or handcut chips are side orders. For dessert, most times you’ll find a decadent dessert for dark chocolate lovers, or the cheese trolley can be wheeled out for those with savoury tastes. 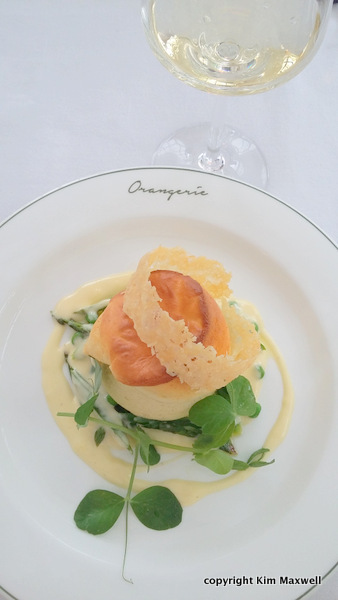 Don’t miss the signature warm, sweet soufflé — mine was Grand Marnier, flambéed, with a dollop of ice cream dropped in. 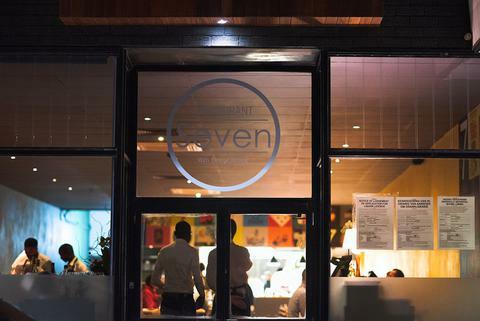 Seven’s food is classics with a twist: visually appealing plates served in a welcoming environment. The long space is noisy when full of diners. It feels like a neighbourhood restaurant yet the crafted plates are pitching quite a bit higher at people who enjoy food and as Jardine puts it “want to eat everything”. RESTAURANT SEVEN WITH GEORGE JARDINE Shop 7, Drama Street, Somerset West. Open for lunch and dinner Tues to Sat. 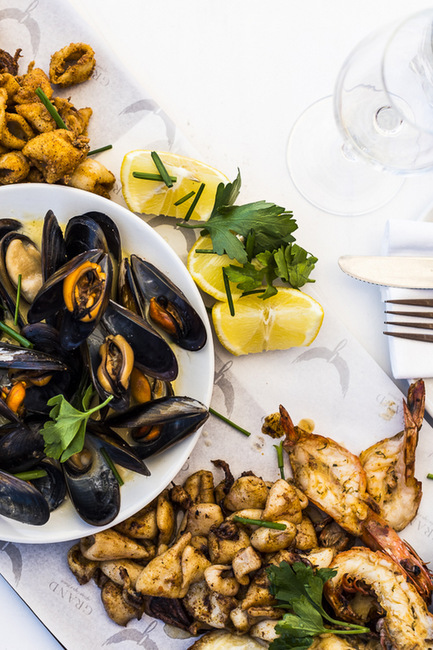 Franschhoek is often called South Africa’s culinary capital and it’s not hard to figure out why. Per square metre, the central village offers a number of quality simple and upmarket restaurants, wine and activities. In between the formulaic cafes and curio shops tripping up tourists in the main street, there are quality dining destinations and delis, plus charming suites and cottages offering luxurious beds. So it’s logical to draw a link with one of the country’s acclaimed restaurants opening in Le Quartier Français boutique hotel in August. 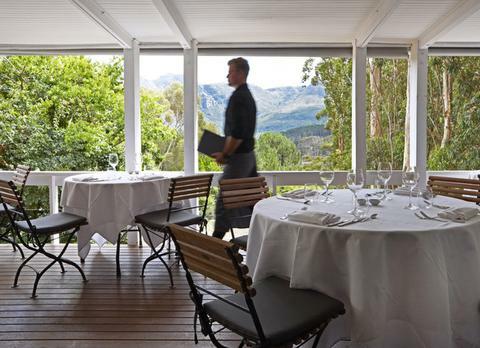 La Colombe restaurant put Constantia on the global culinary map. 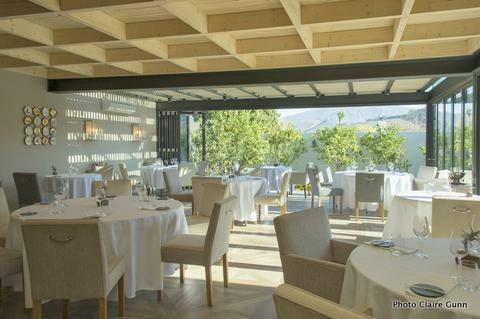 Its chef partners Scot Kirton and James Gaag had similar objectives for La Petite Colombe restaurant in Franschhoek’s main road — for diners to enjoy a special, leisurely wine and dining experience in a country setting. My lunch began with a simple Luderitz oyster poached in creamy Champagne velouté, with verjuice gel and dill oil. Simple and comforting, it was served in a beautiful bowl shaped like an oyster shell. There were hits of citrus freshness, sago for texture, then micro-diced apple in yuzu dressing adding tartness. As a wine pairing the Morena MCC, from Franschhoek, was spot on. Asian-style tuna was an artwork demanding to be admired. What appeared as a translucent disc of yellowfin tuna was shavings of blast-frozen fish. It rested on a creamy, umami base of miso and orange zest mousse. Scattered on top: avocado, assorted blobs, creams, gels, and pickled seeds including miso-glazed aubergine, tart citrus calamansi gel, spicy kimchi, delicate shaved fennel. Flavours and textures balanced one another beautifully. He balances those with “comforting” meat dishes. 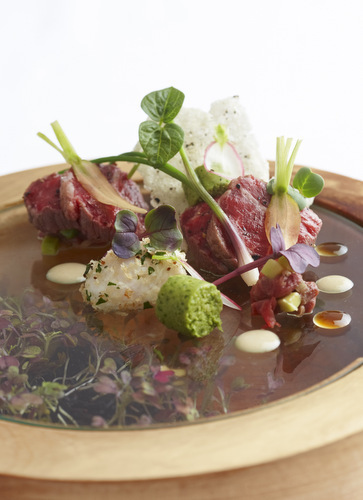 A standout example was the seared, grass-fed beef tataki slices, contrasted with herby marinated beef tartar. Dominant flavours included soya sauce, smoky chipotle, pickled Jerusalem artichoke, red onion, coriander. There was fun in a puffed sago crisp; subtlety in creamy avocado. A surprise too: grated, frozen foie gras melted in the mouth. Rainbow’s End Cabernet Franc 2014 offered delicious sweet fruit. Probably the most memorable part was being invited to leave our chairs and “meet the chefs” while eating a course, standing, at a counter. Chef Kieran Gatenby took us through an interactive dining experience while facing the open kitchen. “Today you’re having traditional Japanese ramen,” he instructed. In a sphere-like bowl of an earthy, soy-based reduction with dainty noodles, soft-boiled quail’s egg, and edible extras, Gatenby poured over a warm broth of juiced celeriac and aromatic oils. Fresh, then woodier notes came to the fore. In summary, La Petite Colombe offers a food and wine journey. Complex, attractive dishes incorporate a layering of tastes, in a setting that opens to a garden. 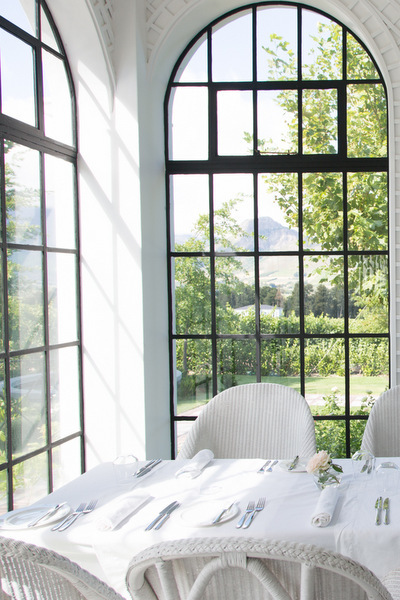 LA PETITE COLOMBE, Huguenot Road, Franschhoek. Open for lunch and dinner daily. 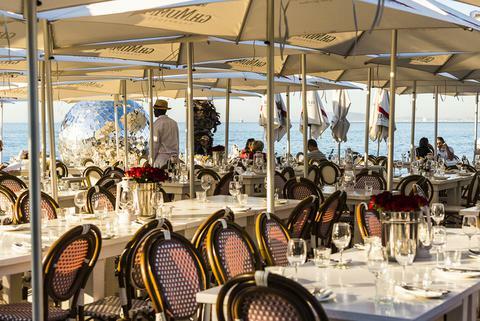 At night, many splurge on nine courses for R1,100 (R1,850 including wine). 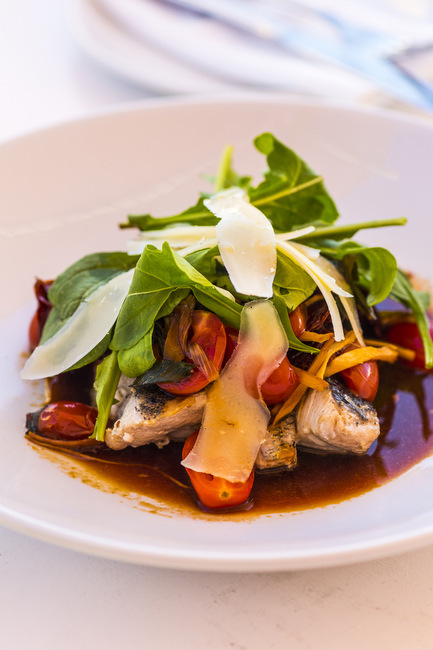 A reduced menu (five courses at R795) is popular at lunchtime (R1,250 including wine). 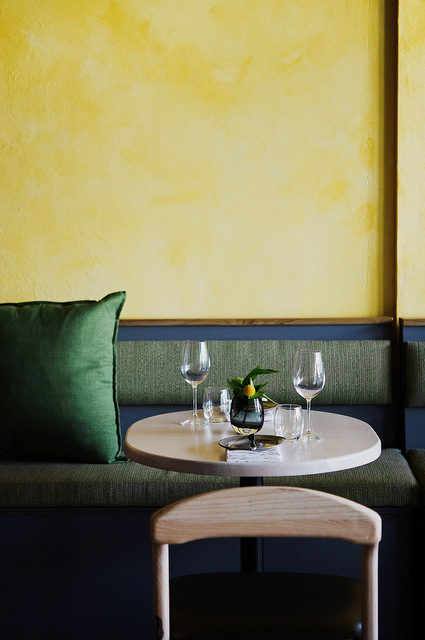 At Cape Town’s newest brasserie, minimalist décor is in keeping with a prudent approach to food and a no-frills style of presentation. 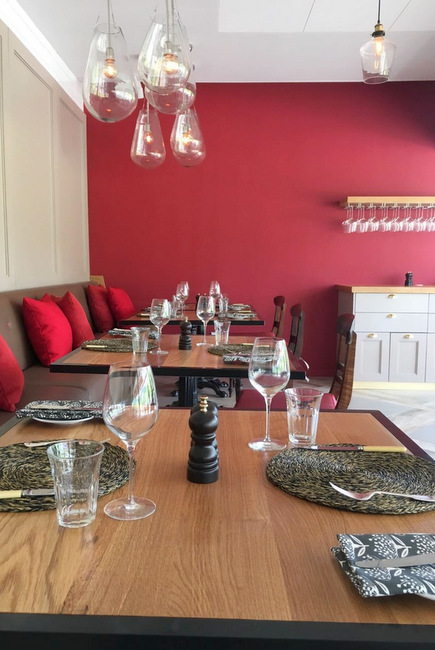 La Tête restaurant opened at the foreshore end of Bree Street in November 2016. The name is French for the head. “I called it La Tête because it symbolises what we do. I use the entire animal,” says chef and co-owner Giles Edwards, butchering a carcass into meaty parts as he chats. Edwards is not one for half measures. He decided to become a chef after a game-changing dinner with brother James at Fergus Henderson’s St John nose-to-tail restaurant in London (their British father loved offal). Edwards dropped out of the University of Cape Town and enrolled at Capsicum Culinary Studio. Newly qualified, he headed back to London to find work at St John — but was turned down. They refused him two more times. After cheffing experience at a one-Michelin-star and then a seafood restaurant, Edwards was finally hired as sous chef at St John. “But the head chef disappeared, so myself and the other sous chef ended up running the St John kitchen. It was five years of heaven,” he says. 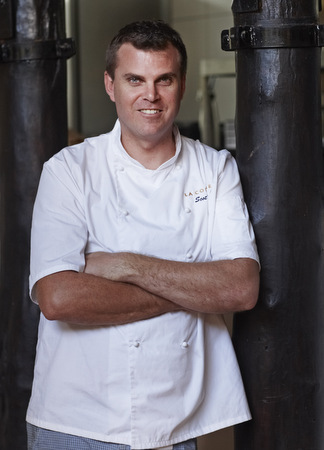 In late 2015, Edwards decided to try South Africa, testing the market with a pop-up restaurant called Salt Cellar, in Salt River. 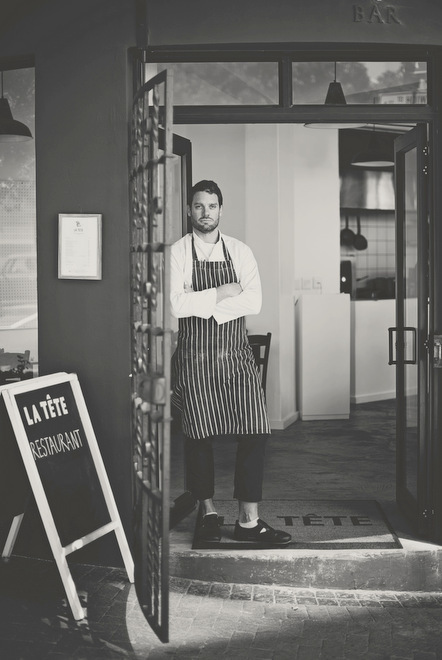 “It was a chance to see how Cape Town would react to pig tails, no foams and gels [on plates].” By the time he launched La Tête a year later with brother James as a business partner, the concept was fine-tuned and crispy pig tails were on the menu. “It’s not so much about nose to tail as about sustainability. It’s using up all the rest of the animal. Everyone’s only using the prime cuts. I can get hold of liver, brains, hearts, tongue, kidneys … It’s also about getting hake,” says Edwards. 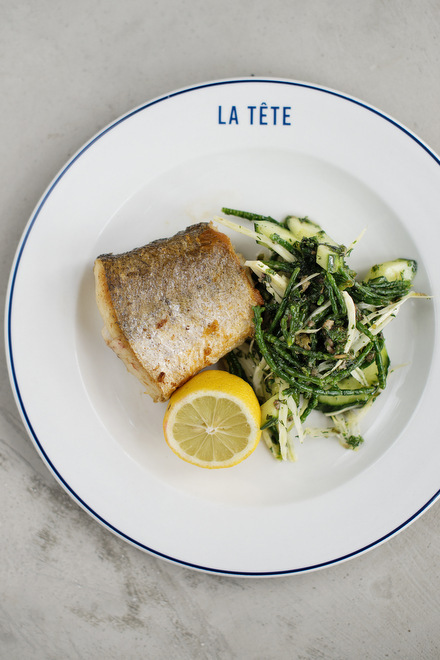 Plainer fish species will always be on the La Tête menu. Meats are grassfed or free range, as are the chickens that supply eggs. At lunchtime, the fish sandwich is a must: it is either hake or angelfish, deepfried in batter, served on sourdough, plus homemade tartare and red pickled onion. I plan to return again when Scotch eggs are on the menu. At dinner, starters are the more interesting part of the menu. It is advisable to select a few. On the lighter side, chilled, sliced octopus tentacles are lightly pickled and served with cucumber lengths, capers and mint. The crispy pig cheek is richness itself, using pork fat to create a confit centre, which is slow-roasted to crunchy crackling and served with crisp, raw radish, creamy mustard and herby greens. 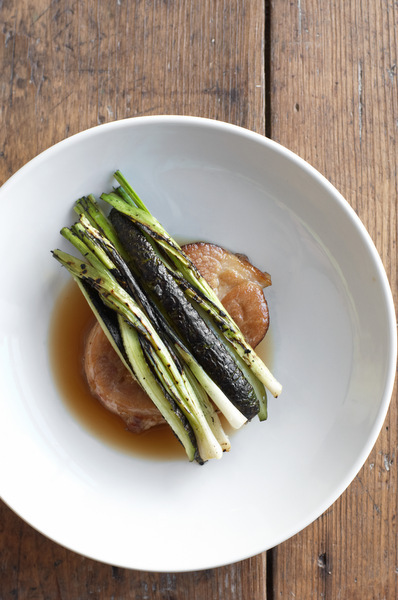 Edwards rightfully calls it the “Rolls Royce of pork belly”. Mussels out of their shells, with buttered leek strands and salty bacon lardons, is comforting in a brothy stock. Salt hake with bread and green sauce tastes clean and fresh, a solid combo of poached, flaked fish, assorted herbs, red onion and cubes of good bread. On the mains, the duck is aged for a week to develop flavour. Edwards also rates the ox heart: thinly sliced, marinated and grilled. 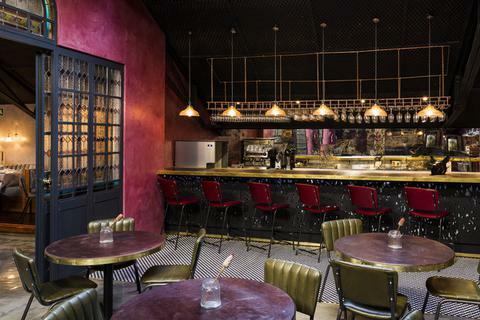 “My favourite way is to serve it like steak and chips, because it tastes very much like steak.” Despite the obvious offal focus, La Tête offers a vegetarian lunch and dinner too. Porcini on toast is worth having in season. 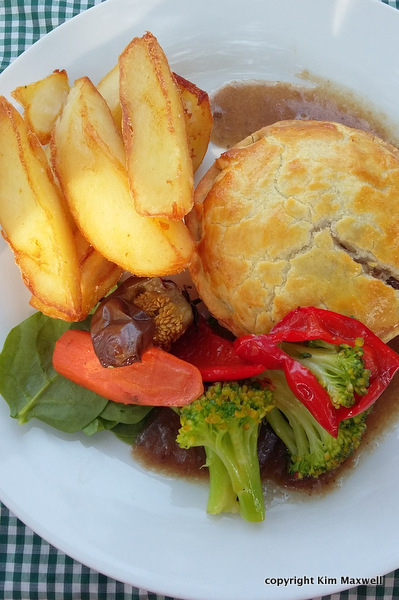 “Our aim is to cook amazing food and to provide an experience around that. 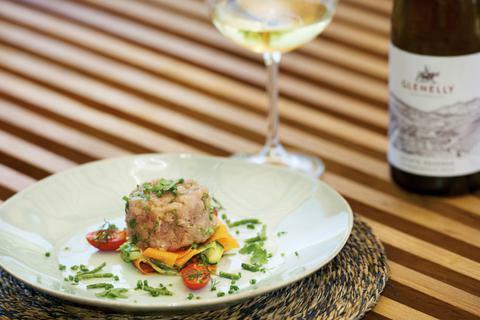 The experience must start with what’s on the plate and what’s in your glass,” says Edwards. 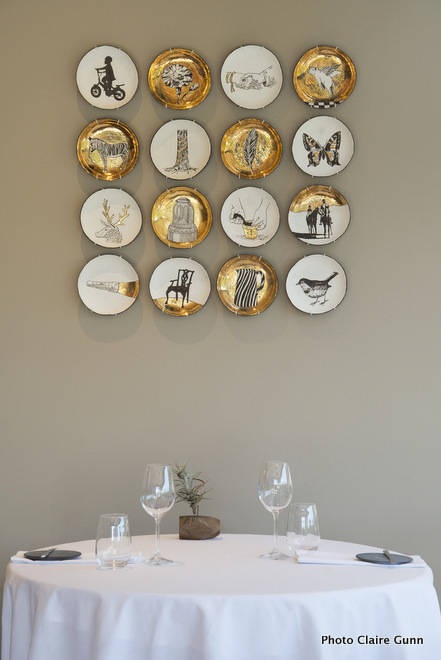 La Tête’s plates embrace simple elegance and a “Parisian bistro twist” in a cow head emblem or a single blue line. His pop-up restaurant was in a Cape Town wine shop. Unsurprisingly then, the La Tête wine list — a collaboration by the Edwards brothers — offers many niche producers’ interesting labels, from Alheit to Storm and Crystallum’s whites, reds and rosés. Wines are sold by bottle or glass, in short-stemmed Parisian brasserie type stemware. 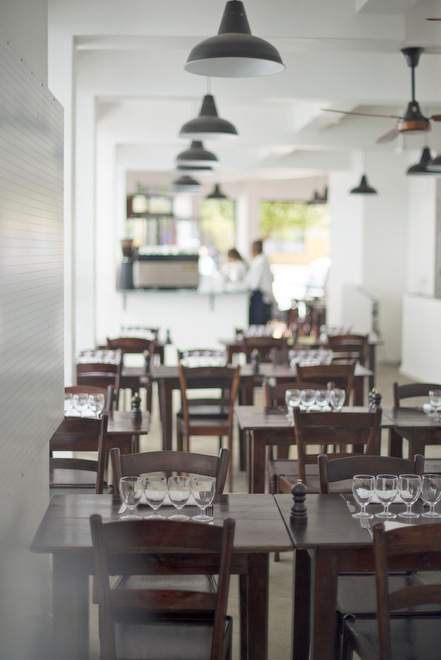 In keeping with the food, the narrow interior of La Tête is minimalist, with stark white walls and white pinboards, a concrete floor and wooden ceiling fans. Custom-made light fittings are by Arora Lights. Stained wooden tables are reclaimed school desks from Swaziland. There are no tablecloths. FABER restaurant’s philosophy of crafting edible bounty is off to a promising start. 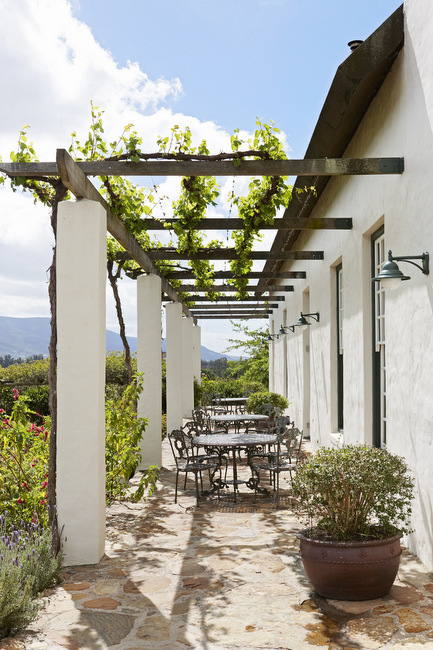 Built in a style similar to the farm’s original 1700 Cape Dutch homestead, FABER is inside the building that holds Avondale’s cellar and wine-tasting area. 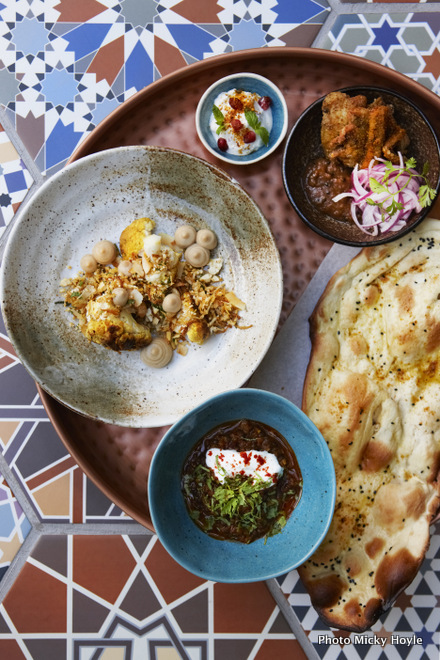 The restaurant’s high-volume ceilings, terracotta tiles and cement floors contrast with a modern open kitchen that is finished with Moroccan mosaic tiles. We wanted a short and catchy name that explained what we were and connected us to Avondale Estate. FABER is not just about being craftsmen: it’s our love for the land and our connection to it … to the chickens that run in the field. My grandpa had a self-sustaining farm in Rustenburg, so we’d go into the garden if we wanted a salad. Johnathan Grieve, Avondale’s owner, also toils in the vineyards here, so the connection fits. There is nothing more exciting than eating food that has a story. I’ve always thought of Paarl as that little town just past Stellenbosch. Yet we are just off the N1, closer to Cape Town than to Stellenbosch. 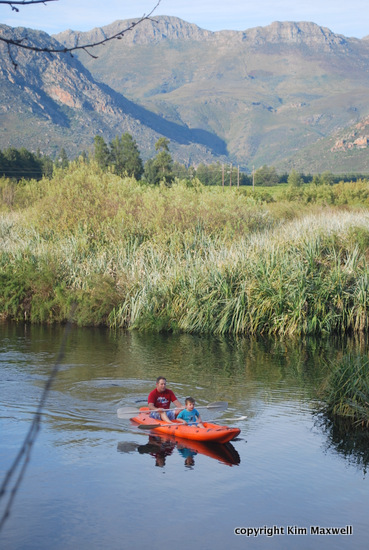 FABER is opposite Boschenmeer Golf Estate and Val de Vie. There are people with money to spend. We drove around and thought maybe we could do something special. Not simple food, but simplicity. Avondale wines are farmed biodynamically so our meat and vegetables won’t come from here primarily. But the idea is to get a lot of our produce from the farm in the next few years, from eggs to broiler chickens and pasture-reared organic beef. 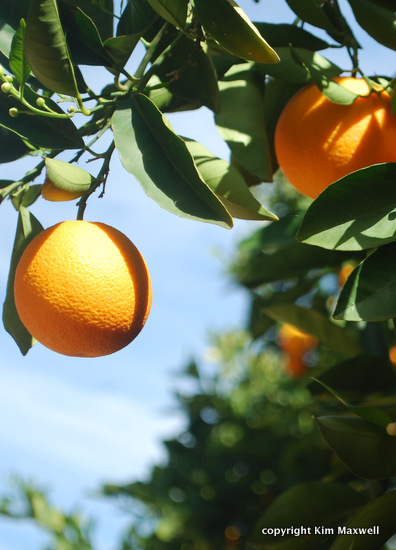 Our menu includes what is available in the field, what is on the farm, what is good right now. We serve Avondale’s biodynamic red and white wines, and will offer other labels once we are licensed. Most of us have lost touch with what farming used to be. We want to showcase Avondale’s chickens and duck and hen eggs from the farm “egg-mobile”. We had a cow that lived its life eating grass from the Avondale field. I had a taste — it’s phenomenal how different it was from feedlot animals. The chickens running here can’t be poached quickly; they have to be slow-cooked. Chicken isn’t usually an exciting option but this is not your average chicken. It is skinny, so the meat is wilder, almost like guinea fowl. That makes it a special chicken in my eyes. We call the dish the Avondale happy chicken because it was happy until it met its end. We’re not here to reinvent our cooking. The style is technical but not overcomplicated: a few key ingredients on the plate. 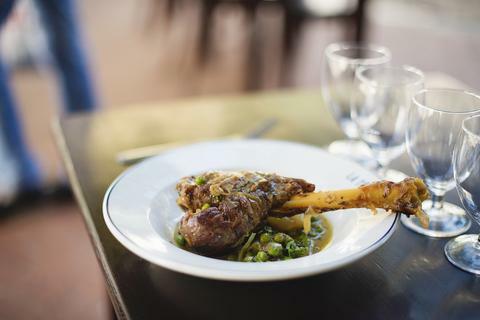 The roasted Karoo lamb shoulder is one of the most rustic things we do — it’s so perfect and tender in what it is. It’s served with pumpkin seed pesto, wilted greens and herbs. The menu will always be one page, focused on what is available. I don’t think we will ever serve a crème brûlée. You might find a soufflé on our menu but with a creative component to it: fermented banana and chocolate, or maybe peaches and beer. 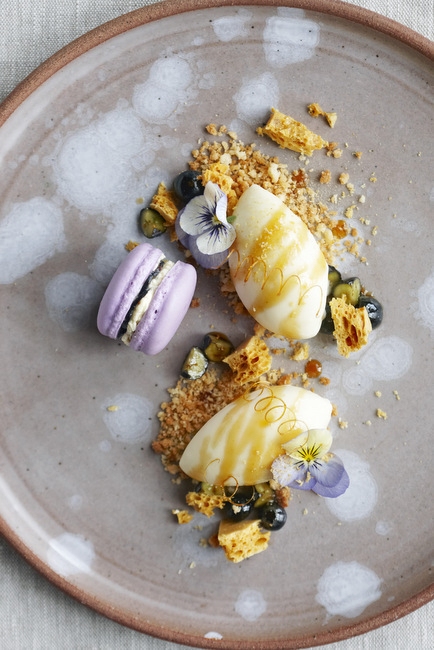 Our popular cream cheese and blueberries dessert (cream cheese and honey sorbet, with coconut crumble and blueberry macaron) was inspired by blueberry cheesecake. 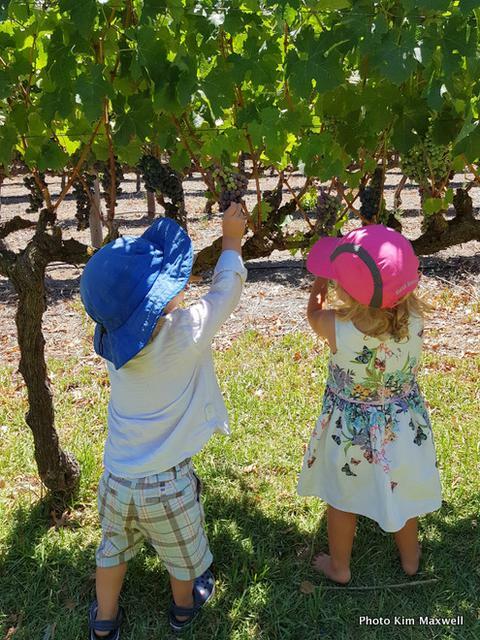 FABER Avondale Wines, Paarl. Open Wed to Sun lunch; Wed to Sat dinner. Cape Town is home to the first global Coco Safar in Cavendish Square. Its owners say it is not just another shopping centre coffee shop. 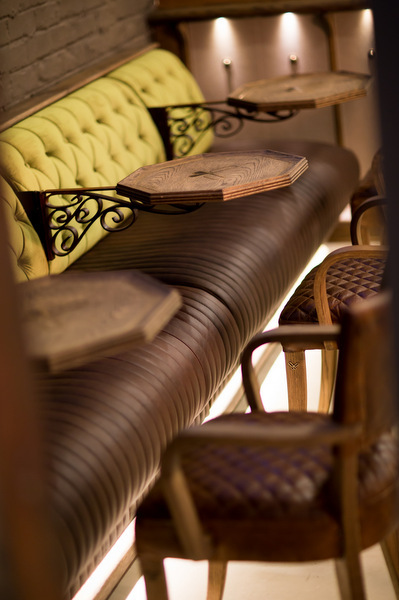 At Coco Safar every aspect is crafted. Croissant Benedict breakfasts can ease into lazy brioche pizzetta light lunches. The café may have a shopping centre din surrounding it, but there is a reprieve, thanks to ceiling fans, jazzy tunes and moody ambience that could be in cosmopolitan Vienna or Brussels. Safajores chocolate-coated buckwheat biscuits. Every coffee served with a glass of water on a beautiful tray. A waitress’s descriptions of exotic fillings: colourful operas, star domes and pastries as exquisite to admire as they are to savour. High tea for two, served in a trio of sweet and savoury waves (the Third Wave is a purist approach to sourcing, roasting and brewing coffee). A crumbly Canadian apricot streusel pecan scone; a keylime and kumquat éclair’s with perfect citrus tang. A chilled, slow-brewed coffee spiked with orange peel. 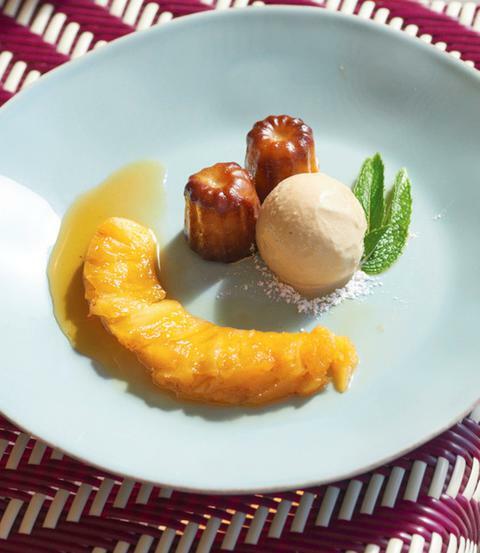 During their research, owners Caroline Sirois and Wilhelm Liebenberg sampled at Pierre Hermé’s Paris patisserie to Dominique Ansel’s cronuts in New York’s SoHo. Liebenberg becomes animated when describing Coco Safar creations concocted after many product development hours in his Willie Wonka-like Woodstock facility. Nearly everything is created locally, from leather-stitched armchairs and crockery to eye-catching uniforms. Banquette seating below mirror panels framed by cast metal with weathered bronze effects. Dangling glass ball lights — they reminded of creamy chocolate truffles — blown by Red Hot Glass in Paarl. At the adjacent retail capsule emporium, collections of coffee and rooibos capsules enticed behind a counter. Their packaging forming a colourful wall backdrop. Why Cavendish Square as your international flagship store? We were looking for one spectacular retail space to allow us to best showcase our unique brand and business model. That is what we found at Cavendish, ideally situated in the southern suburbs of Cape Town, where no coffee capsule retail offering existed. The roll out of other Coco Safar stores in SA and key global markets is in the works. What makes Coco Safar not just another coffee shop? The experience is about daily escapism: it is the first authentic luxury espresso bar and café that incorporates a capsule emporium of its kind, pairing Third Wave specialty coffee and rooibos with couture patisserie and cafe food. We bring the best of Paris and New York in a luxurious cafe bistro-style environment where quality reigns at every level. Our patisserie offering is like no other in SA; our breakfast and casual dining offering very different to what’s on offer in Cape Town cafés. And it’s the first time you can have a plated dessert experience in a cafe environment. Which elements and local design input will be replicated in other stores? Our original store design is reminiscent of the French industrial era and the golden age of travel with Jules Vernes-inspired design elements. A timeless understated luxury setting that should transport anyone who steps into the store to another place and time. We intend to almost exclusively use custom-made local furniture, fixtures, decor elements and store cabinets for the brand’s global roll out as part of a proudly South African export story. This timeless interior design will form the basis of all future stores, but allow for some elements to be incorporated in each new location, to give each store a slightly different identity. Why supply a global coffee and patisserie brand from Woodstock? More than a year ago we opened our central kitchen, patisserie/coffee lab and production facility there. We found the neighbourhood to have incredible creative energy with a true entrepreneurial spirit, just like it used to be in the Williamsburg district of Brooklyn, New York. This environment is highly conducive to hosting and managing a production facility where we can train all our culinary talent, under the supervision of corporate chefs from New York, focused on producing quality sweet and savoury products daily. As part of our hub and spoke business model, where the production facility supplies several stores, Woodstock is centrally situated with easy access to Cape Town neighbourhoods. 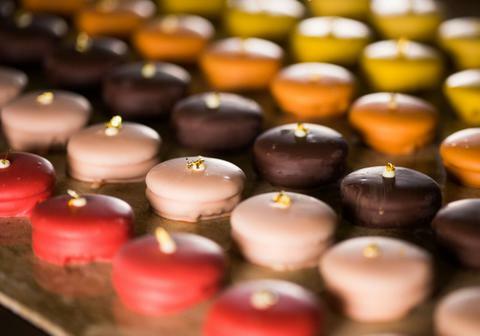 Explain your “couture quality” concept for French patisserie. When speaking of couture quality, we specifically refer to the haute couture nature of our patisserie, which is conceptualized, designed, styled and handcrafted by teams of artisans, as designers crafting haute-couture fashion collections would do. If capsules are the concept, why the adjacent Espresso Bar grind coffee and beans? The Coco Safar business model is truly innovative: offering specialty coffee drinks at our Espresso Bar and Cafe, made with signature beans that can be taken home. 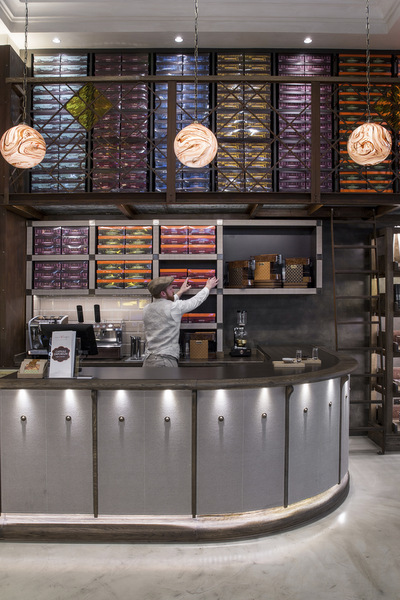 And our specialty coffee and rooibos capsules showcasing a range of single-origin, award-winning auction-lot coffees, in capsules for the first time and sold at the first retail capsule emporium besides Nespresso. How did the custom-designed Idrocompresso machine come about? Kees van der Westen is the undisputed industry leader from a commercial espresso machine design, technology and manufacturing perspective. Considered a true visionary, he created some of the world’s most iconic machines ever to be used commercially. 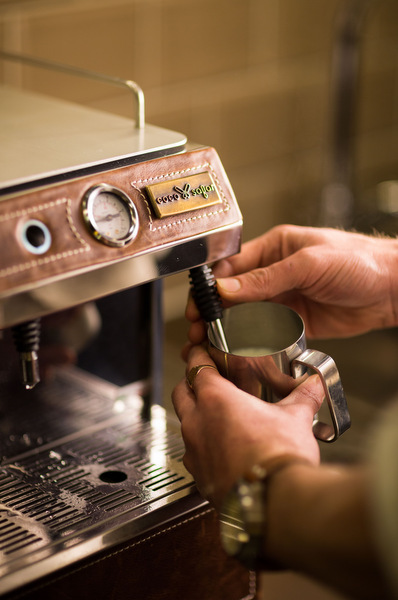 Kees gave us exclusivity to a completely new Spirit espresso machine, marrying lever technology from the past that he brought into the future, confirming his appreciation of our brand as an emerging coffee industry market leader. Chef Wesley Randles and manager Simon Widdison are the hands-on component of a four-way partnership that includes Luke and Sandalene Dale-Roberts (it’s her furniture and interior design here) of The Test Kitchen and The Pot Luck Club, Cape Town restaurants where Randles and Widdison previously worked. First impressions? The dinner vibe is buzzy and service is slick, with no give-away waiters stumbling over unfamiliar menu items or having limited knowledge of a dish, as is so often the case in a new restaurant. Prices are on the high side, but then Randles points out that they go to a lot of effort to source artisan ingredients. So a warm baguette is presented with distinctive butter that has never spent time on a supermarket shelf. Near impossible to resist. Or take the grass-fed rib-eye on the bone is from Oak Valley in Elgin. Tender, full of flavour and charred as expertly as it would be at any top steakhouse. The extra touches in the cafe au lait sauce, and sides including duck fat potatoes or fennel fondant. The menu doesn’t have the wow factor of The Test Kitchen. The style is simpler. More familiar. The surprise is in the sorts of ingredients combined on a plate, the expert sauces or a flavour you can’t quite place. I’ll take you through the menu. Lunch or dinner is contemporary but classic. Organic grass-fed beef carpaccio on goat’s ricotta, with a dressing of miso-cured egg yolk and barrel-aged cherry vinegar dashi. Served with frozen Parmesan and burnt onion powder. Or you could order Saldanha Bay oysters. There are dressing options so you could have a spicy Tiger’s milk dressing. Or just oysters clean. You could finish work in the afternoon, sit in the bar area and have the perfect martini with fresh oysters. There is lamb rump, roasted over the wood fire, served with lamb rosemary jus and a Consol jar of mint jelly on the side. On the plate is fennel fondant, instead of classic potato fondant, roasted down until caramelised. It comes with leeks sous vide and fennel seeds, pine nuts and pine needles. The dining process is a little bit of theatre and fun. So we have bread trollies and cheese trollies running up and down the aisles. The waiter will bring a tray with four plates on it. We created the menu and style for this space. We can bring back that old-world dining where every table is looked after really well, but with that bit of theatre at the table so the dining is fun. The point of the menu is to challenge your focus and taste buds. 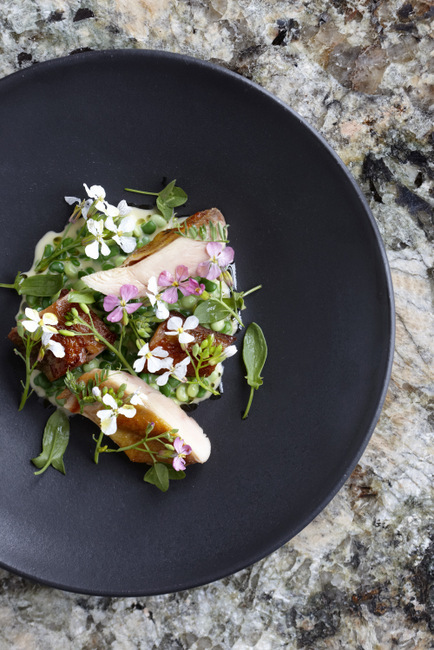 The restaurant doesn’t feel pretentious to sit in and it’s a market between upmarket casual dining (The Pot Luck Club) and extreme fine dining (The Test Kitchen). We’ve never touched on breakfast in any of our restaurants so that’s a whole new thing. Our style of breakfast is recognisable but extremely different. We know Cape Town has quite a breakfast culture. It’s going to take something different and creative to separate us. We’ve tried to be original. It won’t be eggs and a croissant. So we have a Scotch egg. It’s a boiled egg in a layer of pork farce and caramelised onion, on a bed of wild mushrooms, kale, crème fraiche and grated truffle. Another dish is organic trout, hot-smoked inhouse, then glazed with sweet miso butter. It’s served with organic poached eggs and three-month fermented cream. Nobody touches fish for breakfast in Cape Town usually. That’s the idea: we can draw people in because our breakfast is different. I’ve always wanted to do an amazing roasted chicken at the table. So we have a petit pousson. It’s a two-day cooking process where the chickens are cured and stuffed with chestnuts, lemon and fynbos. Slow-cooked sous vide individually, then roasted in the oven, glazed in olive oil. At the table we present it in chestnut husks set on fire, so we are smoking the chicken on arrival. The garnishes are classic. We’re serving roasted parsnip and bread sauce, with organic roasted baby beet and tarragon gravy. The food style is a complete mix and match. You can’t say any of the dishes are Asian or something else. We’ve taken amazing South African produce and used them with techniques we know. I’ve worked with Luke for nine years so I’ve learnt to manipulate the flavour using Asian ingredients in such a way that we can bring out the best possible product. We use certain Asian ingredients to make the dish — not Asian — but the best it can possibly be. I wanted to do a lemon tart that is so much more. When it arrives at the table it looks like lemon tart. 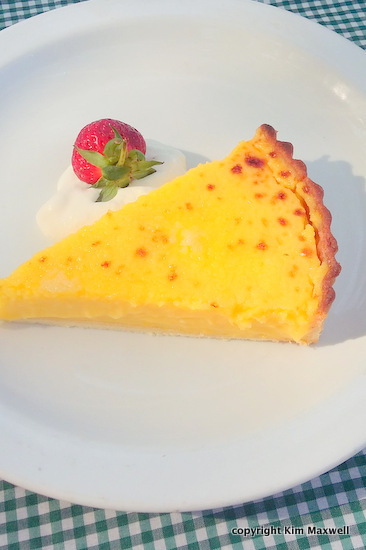 But lemon geranium is blended into the crust, and the custard filling has a touch of saltiness from preserved lemon. 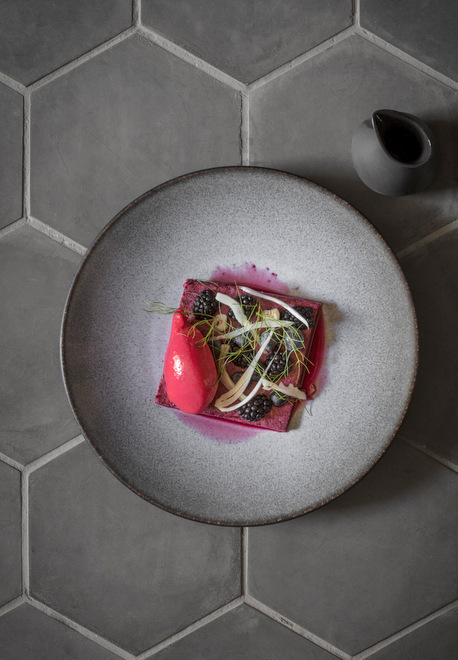 It’s caramelised and served with strawberry and amasi ice-cream, and finished off with lemon charcoal and strawberry dust. I don’t like to screw around and add a million purees to the plate. But then it has to be the perfect lemon tart. I’ve always aimed at being an all-rounder: very capable in pastry, but also on the sauce section or grill. Luke always said to be a really good head chef you need to be able to jump on every section at any time and be better than everyone else. It’s important that you can do that, especially if you have your own restaurant. Simon and I have worked together for years. He is an all-rounder but he knows his wine pretty damn well. I started at La Colombe with Luke just before I turned 21, then at The Test Kitchen (Simon was the GM opening it). Simon and I opened The Pot Luck Club together in 2013. I try to make sure that I am not just following trends. You start off with a base: something completely original. Then you can add techniques you’ve seen somewhere and create something completely different. That is just progression; it’s not copying. The first and foremost focus here is flavour. Everything needs to be delicious first. A version of this appeared in Business Day Homefront magazine in July 2016. The name was inspired by two major streets in Manhattan. 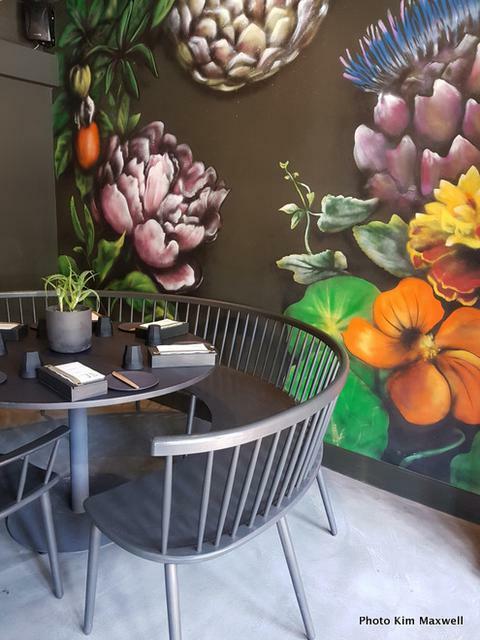 But the charcoal-painted Mulberry & Prince Kitchen and Bar exterior is part of a Cape Town inner city strip of buildings on Pepper Street, between buzzy Bree and Loop. 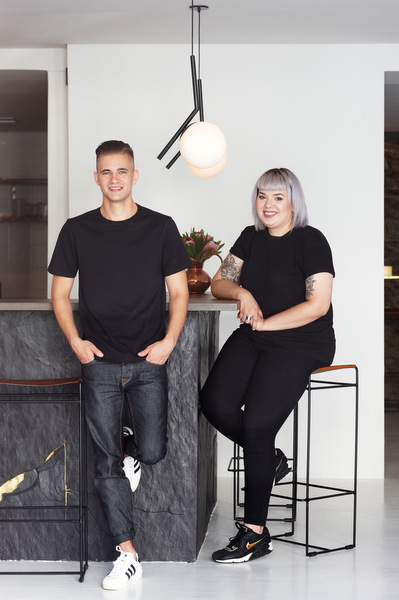 Its co-owners and co-chefs Cornel Mostert and Cynthia Rivera formed a connection while both studying in America. He is Capetonian; she grew up in Brooklyn. They share a keen eye for design and the desire to put a flavour stamp on their plates. 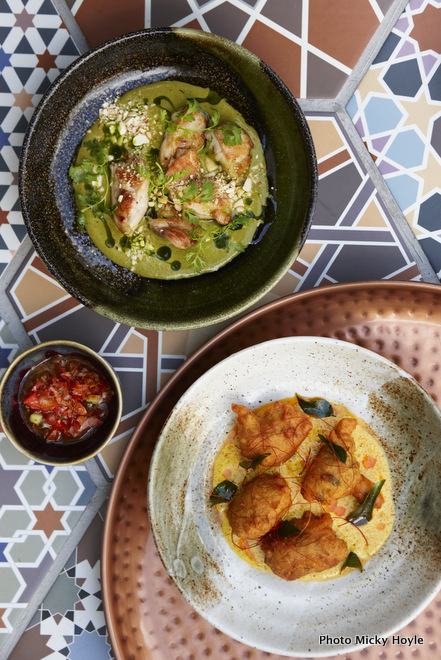 Two will eat well at Mulberry & Prince but the small menu lends itself to three enjoying a shared selection far more. It is food that sometimes hides complex techniques. 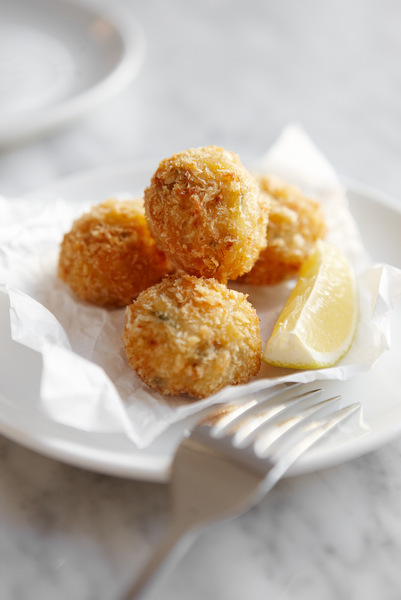 Bacalao fritters are balls of umami fun. There are fresh elements to sliced kohlrabi with walnuts, shaved Parmesan and mint, balanced by persimmon or apple sweetness. Labour-intensive ricotta dumplings have a lightness of touch, served with dainty shimeji mushrooms in a pool of leek and scallion green sauce. 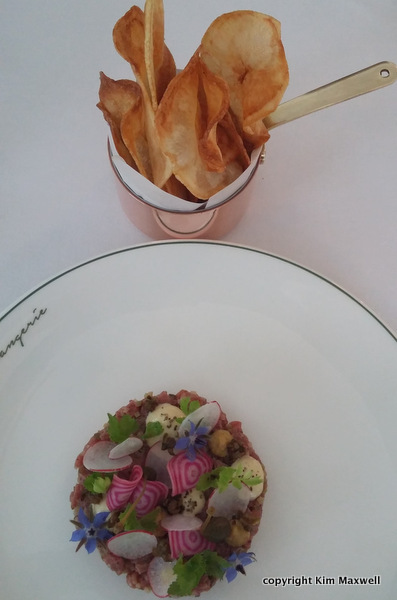 Steak tartare or aromatic lamb ribs both have their culinary merits. The pork brodo, a sous vide pork shoulder steak in broth, is all about comfort, but has an element of surprise in unusual cucumber lengths with their skins charred black. You will remember the sweets. The perfection of buttermilk panna cotta lifted by cherries in hibiscus vinegar. A wickedly moist chocolate cake cloaked in French chocolate ganache, whipped cream and sea salt. Much like the restaurant, the eating experience is about pared down elements with beautiful accents that linger. Where and how did you meet? Mostert: At The Culinary Institute of America in New York, in the same class. 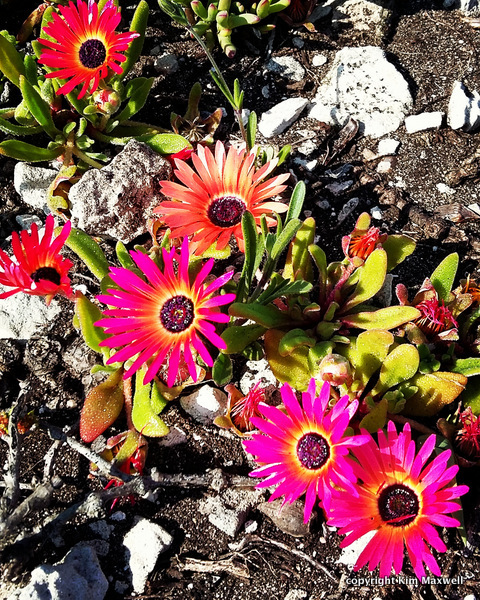 Why Cape Town and why now? Riviera: We’ve been friends for some time and we always talked about doing something together. It was about not wanting to work for other people and do their menus any more. We had so many ideas so we thought: why not try it out? Your concept for a local restaurant? Mostert: Something different, while introducing diners to modern American cuisine aside from burgers and fries. Some of our ingredients wouldn’t be on most Cape Town menus. 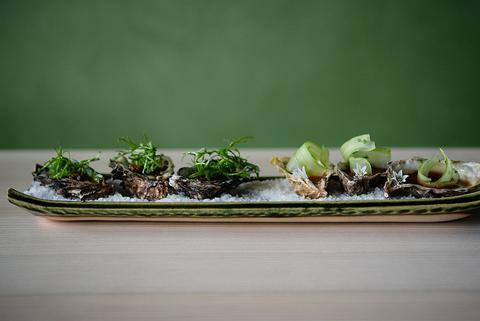 Endive, kohlrabi, stracciatella cheese … We like to order oysters or beef tartare when we eat out, so that’s why we serve it. 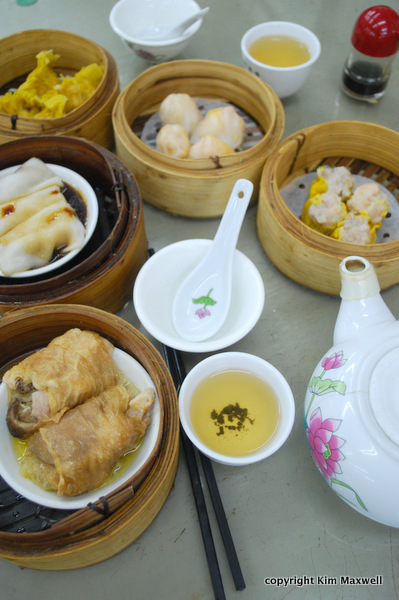 The menu is designed with small to mid-sized plates for sharing. It’s how we like to eat, where everybody shares around the table. It creates a spontaneous vibe. Any overlaps with the New York and Cape Town dining scene? Riviera: Bree Street, around the corner, has a lot of similarities with Bedford Avenue in Williamsburg, Brooklyn. Brooklyn is kindof what Bree street is turning into: restaurants, boutiques and street artists. But the food is still quite different. How do you divide the roles? Mostert: It’s only Cynthia and I in the kitchen. For dinner service I work the hot line. Cynthia usually does the cold salads and desserts, but we mix it up and help each other too. You are both young to own a restaurant. How do you rate your chances? Riviera: Sometimes we’ve felt that because we are young people don’t always take us seriously. It’s annoying because if we weren’t sure that this was what we wanted, we wouldn’t have taken this chance. We aren’t prepared to accept mediocre standards, whether it comes to the products from purveyors or anything else. 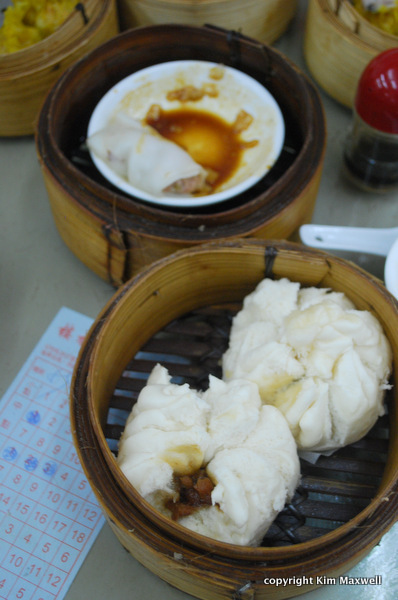 Many of the dishes seem quite minimalist and fresh. Mostert: We’ve tried to keep it clean and simple. But if you look further, it is often quite complex. For example, the ricotta gnudi dumplings take three days to make by hand. A version of this appeared in Business Day Homefront magazine in June 2016. What made a mining exploration company repurpose a nondescript space in industrial Ndabeni into a smokehouse barbecue restaurant and microbrewery? To fill a gap for nearby Pinelands residents to enjoy drinks and dinner. It’s a place to pop in after work to meet friends. 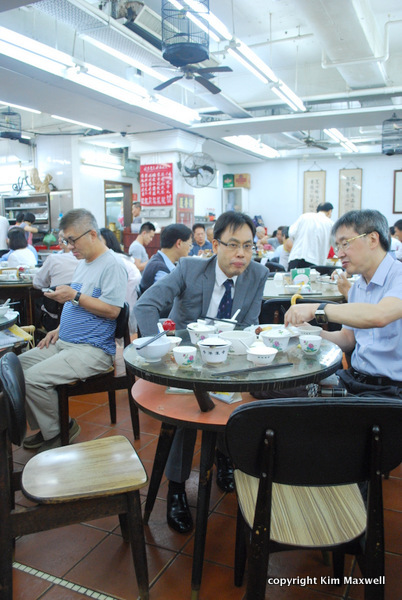 The dinner-only customers are diverse, a mix of boys out with mates, hip couples, middle-aged women and families. The menu is designed so diners order a few tasty dishes to share. 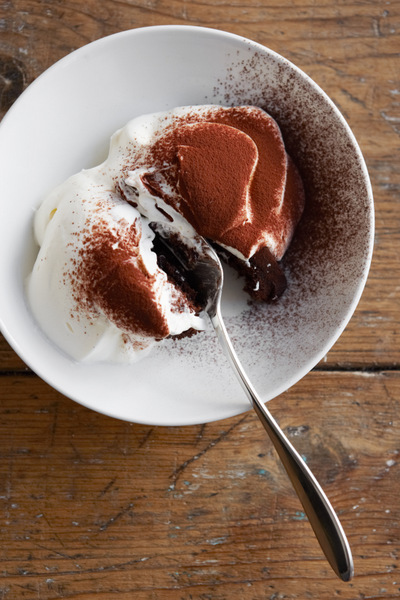 It’s casual and meant for fingers, and you can finish sweetly with a pastry or a sorbet cone. Most people start with ‘Snacks and move on to ‘Barbeque’ and ‘Sides’. 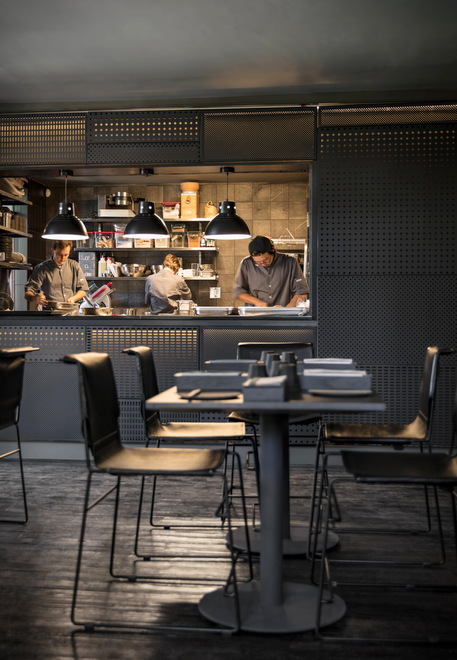 An unused garage in this unsexy, industrial part of Cape Town might sound like an unlikely location, but director/chef PJ Vadas says he never doubted that the concept would work. 1. Why a Texan smokehouse? South Africans love meat and beer, so it’s a simple thing. We cook everything on fire (even our veggies) so it takes you back to braaiing. 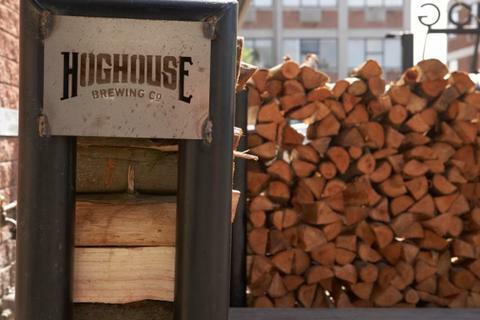 Hoghouse obviously offers pulled pork and pork ribs too, but it’s our beef brisket that few other restaurants do well. 2. It sounds easy. Is it? I came back from Texas and designed our mobile smoker, which we park out front. It took us a few months, trying different woods (we’re using rooikrans) to settle in. How it works is we put the meat in and wait. The technique is difficult because the meat has to be hung properly and can be sinewy, so there’s nowhere to hide. Ours is grassfed free-range meat from Spier. 3. Does an industrial space work? Yes, it’s a working brewery and we can smoke meat for 18 hours at a time without upsetting the neighbours. The cheaper rent allows us to have more space and more affordable food. People can eat well for R200 a head. The idea was always to have a restaurant for locals. We knew if it was affordable, offered quality food and had enough safe parking (customers park inside a security boom) people would come. 4. The secret? 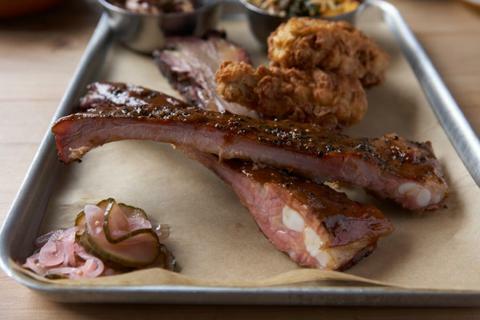 It’s all about the smoker. There’s no gas, just rooikrans wood and hot smoking. It’s low and slow. There’s only salt and pepper on the meat. Our pulled pork smokes for 18 hours, while free-range beef brisket is tender after 14 hours. 5. What about beer? 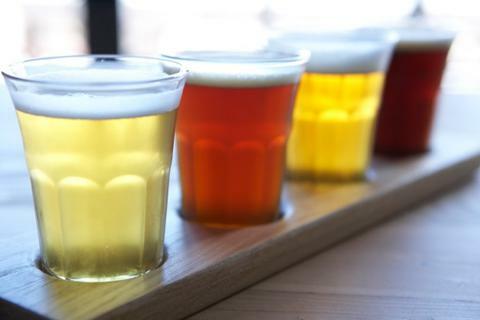 Five ales are all brewed on site. We can brew a 1000 litre batch at a time. 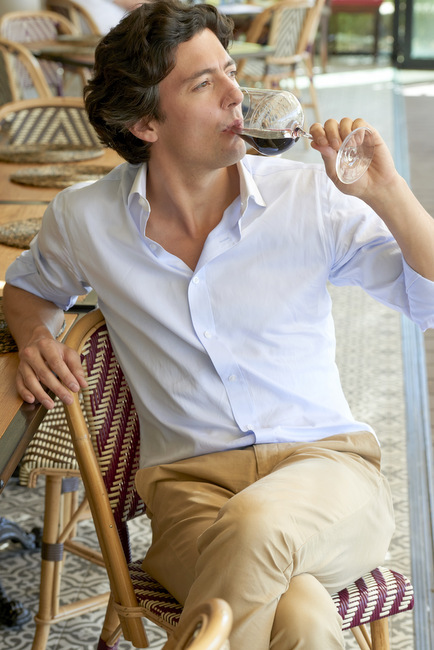 Joachim Blackadder is a sommelier who manages the brewery and does our wine list – some wines are blended for us. 6. What’s popular? Our homemade hot sauce, beef brisket, and pig’s tails dipped in honey mustard. We’re offering a Scotch egg coated in black pudding. 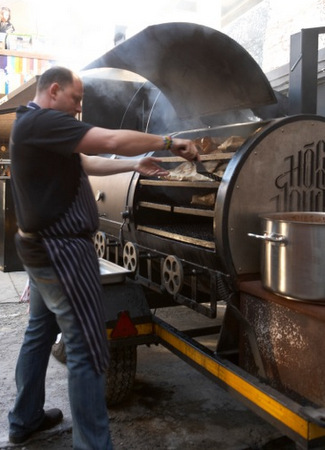 Every Friday we also smoke a pig’s head and then roast it to crispy – people are loving it. 7. What’s on the side? We have a lot of vegetarian regulars, which sounds like a contradiction, but the cauliflower with goat’s cheese, caper and sultana butter is probably our most popular dish. Pineapple Kimchi is a hit too. We do a braai broodjie of Spier’s potato bread, Huguenot cheese, onion and tomato, cooked on the grill. 8. Describe a Hoghouse regular. They range from 25-year-old students after a beer and brisket bun, to pensioners from Pinelands coming for a hearty supper. Some Stormers and Springbok rugby players recently discovered us. They tend to order smoked brisket by the kilo. Pinelands didn’t really have a bar and meeting place. Now it does. 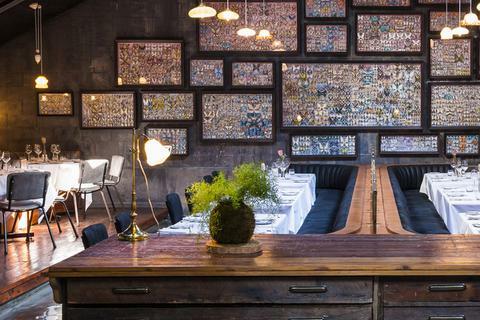 Some of South Africa’s top restaurants are located at the Old Biscuit Mill in Woodstock. The Test Kitchen and Pot Luck Club of course. And, offering an altogether different eating and drinking experience, Burrata. One of my go-to dining spots for modern Italian dining: comforting yet skilled; offering a twist when it comes to flavour combinations. The new winter menu has plenty to see you through from autumn’s nippiness to spring. To start, a few items from the antipasti section are best shared between two or three. Worth having is the fried cauliflower pops which you dab with pesto, spicy lamb meatballs on a bed of quinoa, and Sicilian caponata, aubergine and tomato given a crunchy lift with bites of fried capers. Flavours are simple: a pesto of artichoke and spinach works a treat on a slice of pizza flatbread. Main courses include a few creative fish and steak items, but our group stuck to pasta and risotto options. No regrets. A Burrata signature is back for good reason: a Parmesan risotto has pliable bite melding with umami creaminess, dotted with plump marrow bone insides. Preserved lemon for added delicious. Exec chef Annemarie Robertson says the secret to all Burrata risottos is starting with a ‘stock’ of caramelised Parmesan rinds, onion and garlic. I love the idea of using up the end of this cheese and imparting lovely saltiness. - Rigatoni pasta with slow-braised springbok shank. Brown onions and a meaty jus gives this dish classic flavour depth, and serving it with kale brings it very much into 2016. 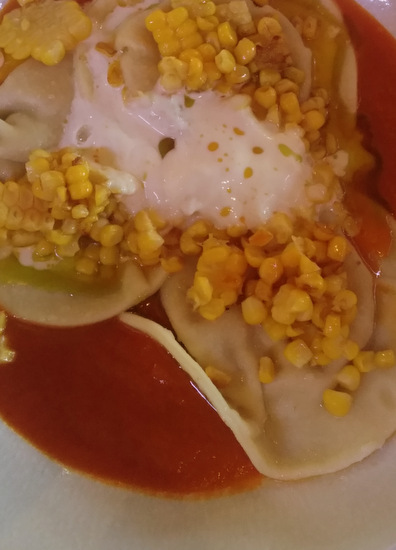 - Ravioli (large ones) filled with some sort of squash, finished with sweetcorn sliced off the cob, and a gentle smoked paprika and lighter-weight red pepper sauce, offering fresh vibrancy and plenty to interest if you’re in a vegetarian mood. 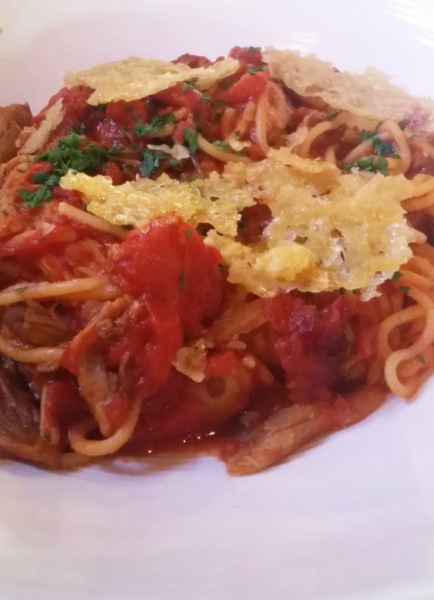 - Spaghetti, unusually served with velvet strands of pulled pork, in an intense tomato and wine sugo. Parmesan crisps add an extra element. 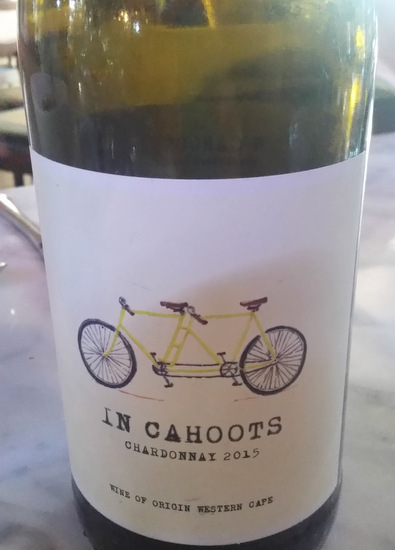 Grant has brought out a joint label at his three restaurants, aptly named In Cahoots with a tandem bicycle on the label. His wine partner is Chardonnay specialist winemaker Richard Kershaw. It’s everything you’d want in a fuller-style Chardonnay, and well worth it for R280 a bottle. Sweet selections are small yet focused. They move with the season into heavier territory. 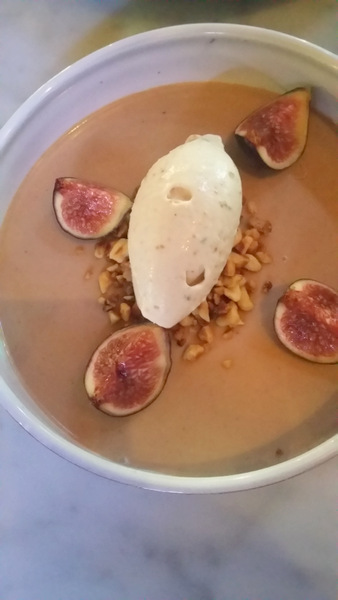 - A hazelnut panna cotta tastes almost cocoa-like (it’s also the colour of pale chocolate) but works well as a pudding eaten all together, with a sprinkle of hazelnuts, fresh fig and fig gelato. 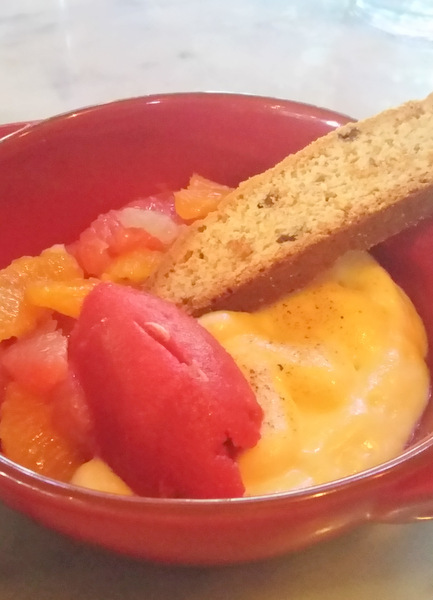 - My favourite, creamy lime zabaglione, served with a zesty winter citrus salad of assorted grapefruit and orange, and raspberry sorbet. After good wine and the heavier weight of winter food, it’s the ideal finish on a note of lightness. 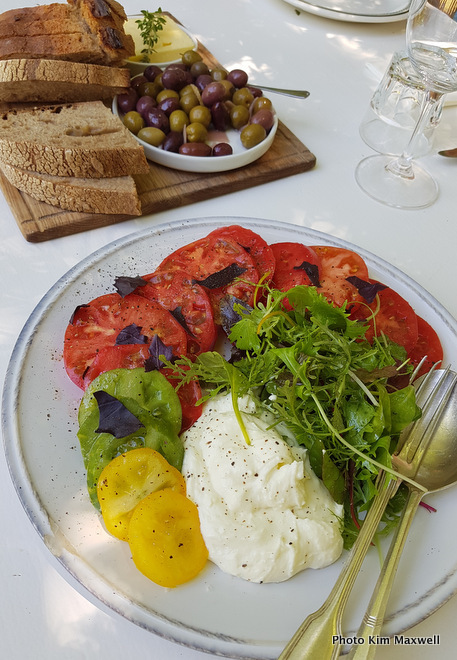 BURRATA, The Old Biscuit Mill, Albert Road, Woodstock. 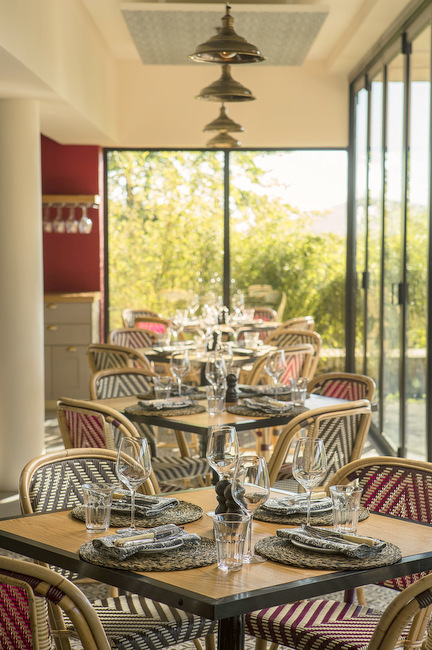 Tackling the winding roads of Silvermist Mountain Lodge to reach La Colombe restaurant in its new Constantia Nek location, the gradual elevation and snatched glimpses of Constantia vineyards focus your mind on your appetite. On breezy days, a mass of trees whistle. Inside the restaurant an intimate private room offers views of the white gum forest on one side, while a bar at the opposite end leads to casual courtyard tables. The open kitchen offers drama for indoor diners, but the plum seats are on an enclosed terrace at the gable end, where windows open to show off mountains, gums and produce-filled vegetable boxes below. Source Design wanted the new La Colombe to feel like an elevated timber tree house up high on an organic wine farm at the top of Constantia Nek. The design brief used a ‘fresher environment’ to draw attention to La Colombe’s intricately composed dishes. The crisp white interiors tie in with white table linen, while walls mix an array of charcoal and dove greys. Aged oak floors and black cast-iron metal straps hint at the wine barrels hidden in the cellar below. 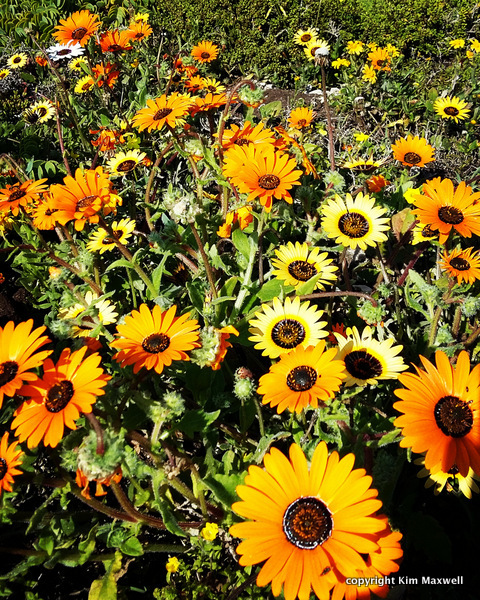 Silvermist Estate is the only certified organic wine producer in the Constantia Valley. 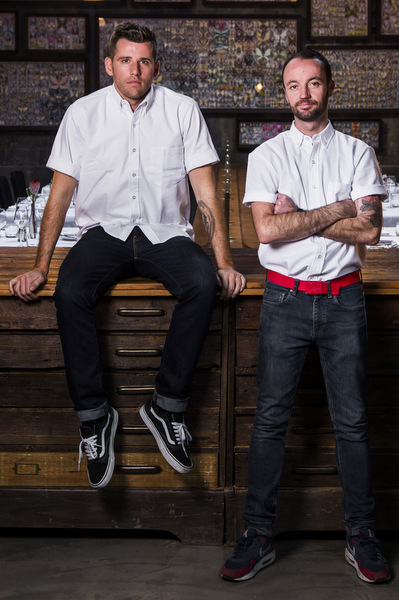 Andrew and Troy Constandakis own La Colombe in partnership with chef Scot Kirton. 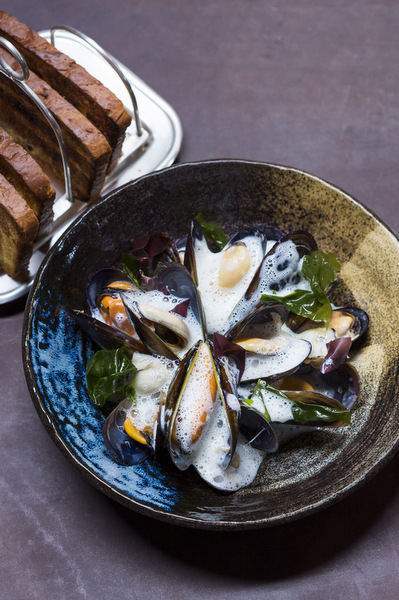 Front-of-house manageress Jennifer Hugé takes care of the rest, from staff training to precise food-and-wine pairings delivered in quality stemware. This is a restaurant where you’ll recognise the same serving staff year after year. They effortlessly describe dishes despite multiple elements and seem to know how to make diners feel special but not harassed. 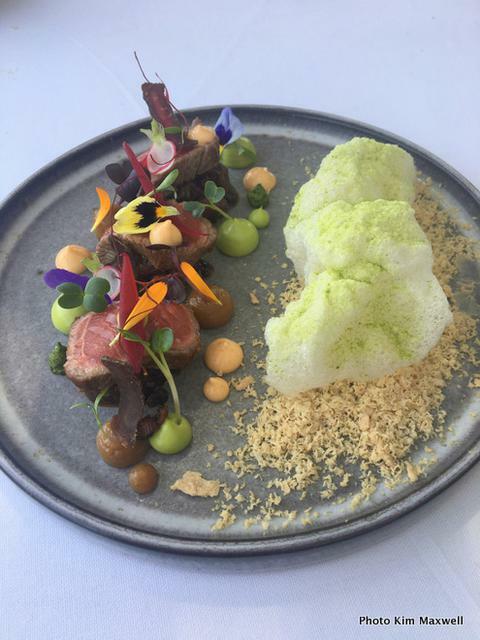 La Colombe ranked second in SA in the recent Eat Out awards and Scot Kirton was named Chef of the Year 2015. Depending on how many courses you are having, lunch or dinner could start with home-made breads and innovative butters. It could partner raw and cooked together in a beef tartare mixed with seared beef tataki and assorted Asian flavours under a crunchy noodle nest. Perhaps a vibrant, unusual cucumber and strawberry dessert, coffee arriving with extra sweet nibbles. This is skilled food that is as beautiful to look at as it is to eat. It requires a higher spend for that privilege. 1.’It’s not just a dish, it’s an experience.’ Why? 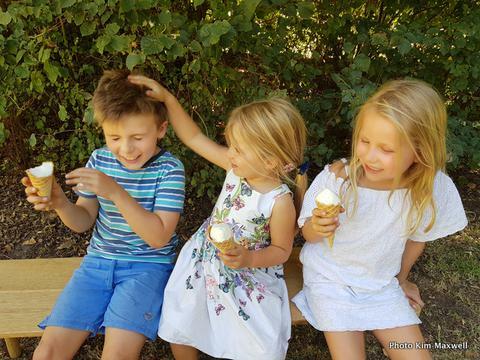 At La Colombe we don’t just serve food; we try to create memories that last a lifetime. 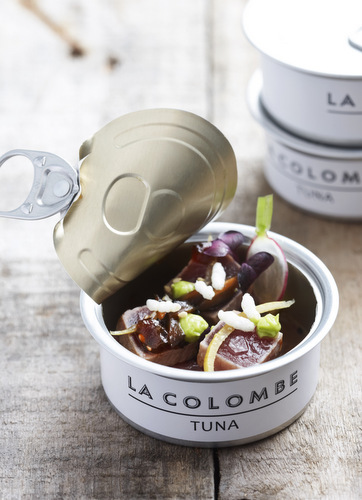 We try to be slightly playful with our food so that it will be remembered, whether it is serving our tuna in a sealed can with key ingredients printed on the label, or just a funky way of plating something. 2. What does it cost? We offer an à la carte lunch menu. 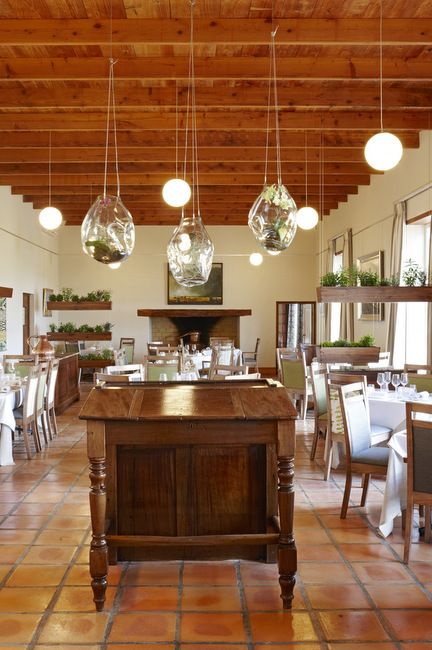 For dinner we have four courses for R535, or an eight-course tasting menu for R790 (R1 190 including wine). 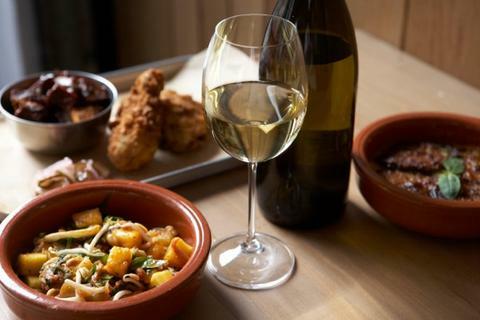 3. Who thinks up the optional wine pairings with your dishes? Jennifer Hugé is the main force behind the wine pairings. She works closely with me, has an incredible palate and her knowledge of wines wows our guests every day. 4. One of your signatures is scallop and subtle Korean kim chi cabbage with sweetcorn. Other menu favourites? Yes, the scallop and kim chi, and the tuna with ponzu, wasabi and ginger in a can, are our two signature dishes. Other menu favourites are bone marrow and pickled fish on toast, with capers, herbs and truffle. Some favourites remain even when seasons change but others are replaced more regularly. Some dishes may take 15 attempts before they make the menu. 5. When did you plant the veggie garden? During the building phase of La Colombe, the chefs wanted a project to fill time in between menu planning, so they decided to plant a garden filled with all the herbs and seasonal vegetables used in the restaurant. 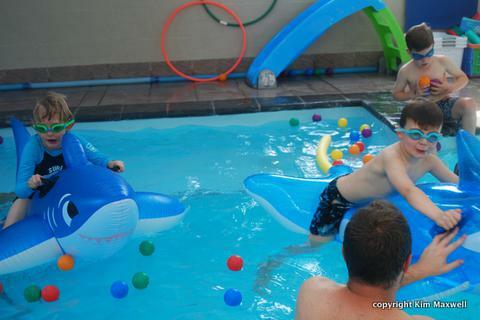 It has been a great success and guests love it. 6. Is it about awards or repeat customers? 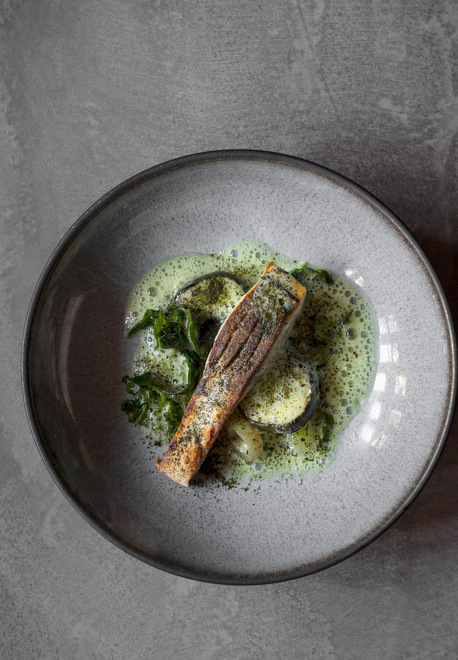 It is definitely about regular customers that support us throughout the year, but the awards make it worthwhile for chefs to gain recognition for their hard work. 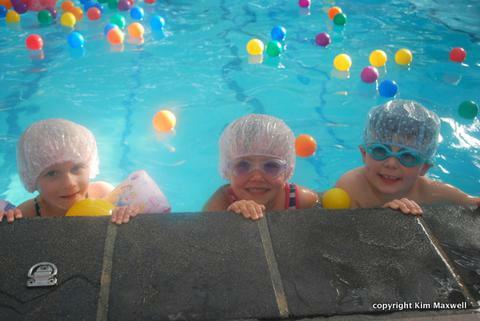 Awards also bring first-time customers to see what all the fuss is about. We seem to be getting more dietary requirements from guests – some come in with cards printed with 20 things they can’t eat – so it becomes quite perplexing at times, but we challenge ourselves to meet them. 7. Is there a typical La Colombe diner? 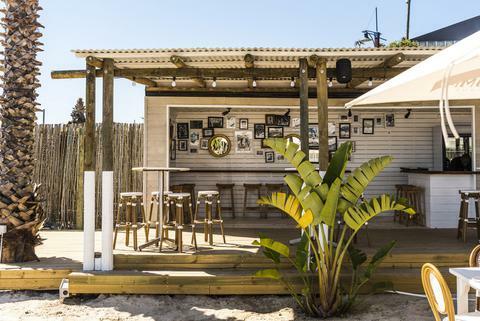 Lunch is a lot more casual – guests are welcome in shorts and slops. Dinner tends to be a lot more formal. La Colombe is not only a destination restaurant for tourists; we have very loyal locals throughout the year and offer great winter specials in the off-season. 8. You said a hypercritical audience judges every plate. Solution? The pressure is huge to deliver on every plate. So the food can’t be over complicated: every item on a dish needs a purpose. It is often very tempting to just keep adding components, but dishes are often better through removing components, keeping it simpler and focusing on flavour. Six of us tried out Open Door’s new breakfast deck on Sunday and had a tastily lazy morning. There are plenty of good breakfast spots in Cape Town but most are indoors. 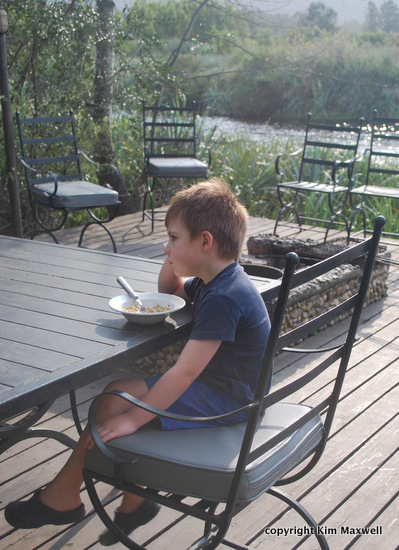 The appeal of Open Door is that you can sit outside and enjoy rural views of a BMX track with lovely mountains behind. Executive chef Annemarie Steenkamp and pastry chef Christine de Villiers put their heads together to make the cereal and hot options more creative than the usual breakfast fry-up. 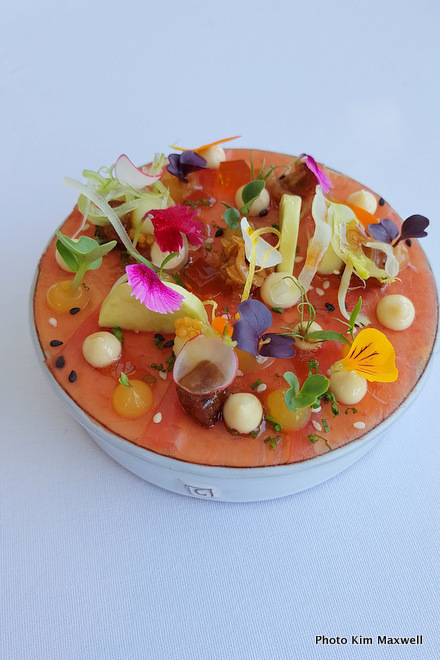 They’ve both worked at Le Quartier Français in Franschhoek at some point, where even the buffet selections pitch way above the average hotel breakfast, and nothing is out of a box. So a similar attention to detail shows at Open Door. We had two children under seven that hopefully didn’t annoy too many adults with their running about outside. A plus is a great BMX track within walking distance – they charge R50 a day for kids of all ages. It’s just a little far away to watch your kids from an Open Door breakfast table – now that would be styling. But could become a handy combo with breakfast all the same. We vowed to return with mini bikes to spend some time getting dusty. What to eat The beetroot yoghurt with homemade nut, seed and coconut granola sounds unusual, but we stuck to hot items. 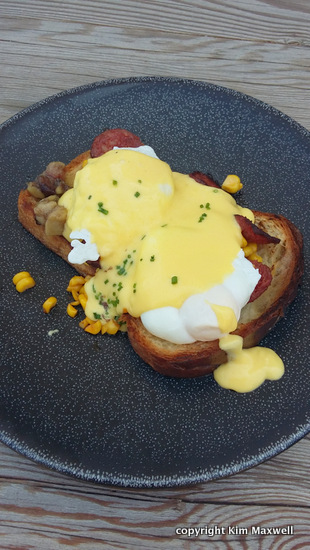 A thick slice of toasted brioche with two poached eggs, tangy citrus hollandaise, chorizo and sweetcorn is the flat-out winner here. Bits of fatty bone marrow are hidden under a velvet coating of sauce. 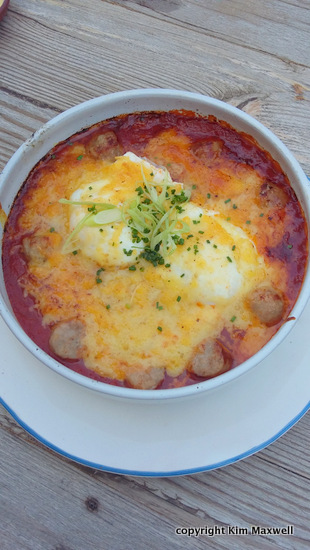 If you’re lusting after comfort food, a baked sausage, poached eggs and spiced tomato sauce dish with melted gruyere cheese is a good alternative. Only a little lacking in chili heat. Two food-inclined boys were happy with a homemade croissant and scrambled egg (an alternative was boiled eggs with sourdough toast soldiers). The only disappointment was the waffle topped with maple syrup, crispy bacon and two fried eggs. Nothing intrinsically wrong, although a waffle’s ability to soak up syrup and seem dry never helps. It arrived in an old black frying pan and seemed to be more about presentation than a well-matched combination. When to go Breakfast is only served from 9am to 11am. 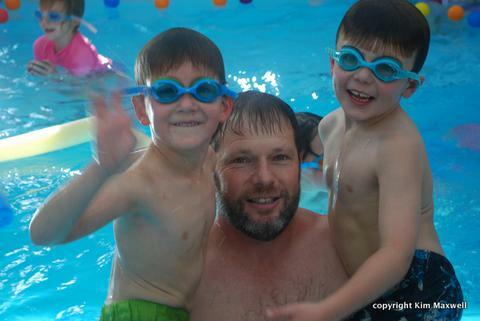 Who to take Well-behaved families, couples and groups of friends will all enjoy this. What to drink The juices are made properly. 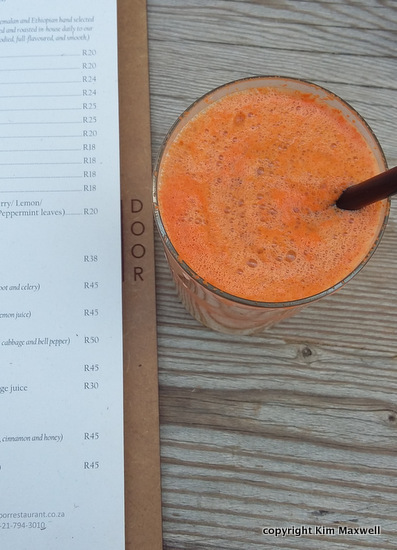 The apple zing (apple, carrot and lots of fresh ginger) gets my vote. How much? Gourmet granola R68, freshly made juices R38/R45, flat whites/cappuccinos R24, homemade croissants with scrambled egg R42, creative savoury dishes (benedicts, waffles) R72 to R82. I’m often asked to recommend Winelands picnics. I tend to make the effort to drive out to a restaurant. But having a husband who isn’t flexible enough to sit hunched and cross-legged for longer than five minutes, means spreading a blanket isn’t a popular choice in our house. Fortunately he didn’t have to do that when we were invited to experience a Sunday family chicnic for four at Allée Bleue. Their idea of a picnic is a table and chairs, and waiters bringing drinks to your checked tablecloth under a shady tree. Younger kids are kept busy with a trampoline and jumping castle, and there are lovely lawns to run around on. Live music makes Sunday picnics a particularly good choice. 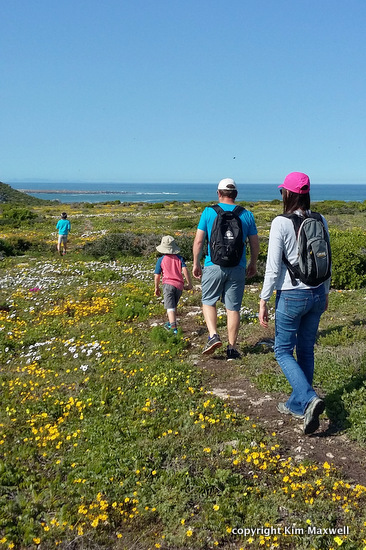 Although much of the farm is filled with practical packaging warehouses and hydroponic tunnels, the picnic area makes the most of its proximity to charming Cape Dutch buildings. The wine tasting centre recently moved there, so it’s handy to collect a few bottles en route to your car. Allée Bleue grows, and supplies retailers, with incredible leaves, herbs, (including less usual tarragon and tatsoi) and fruit, aside from delicious wines. Their Chenin Blanc and Isabeau (Semillon Chard Viognier blend) have long been favourites of mine because they are so food-friendly. 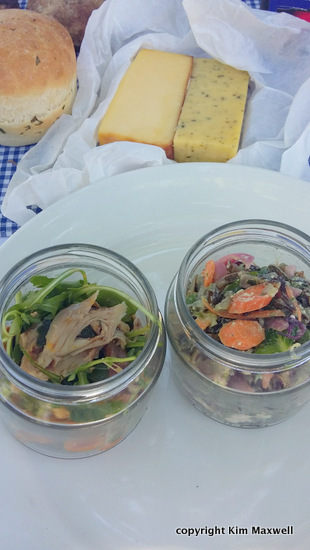 So unsurprisingly the Allée Bleue picnic is a tasty showcase of the farm’s fresh produce. It goes down well in hot weather, especially if you’re big on salad – we had five of them, plus two artisanal cheeses. A lot of thought goes into providing quality homebaked breads, incredibly creative salads, a vibrant salsa verde, and some savoury preserves. It is beautifully presented in a basket where the sides open out, and all the food is served in jars with lids. So a lovely country experience all round. On the salad note: the wild rice with smoked feta and baby carrots was delicious. 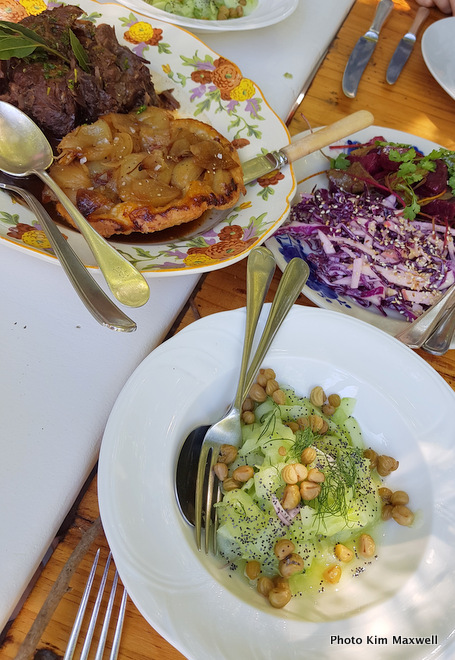 There was mixed baby leaf salad with grated Parmesan, plus a crunchy baby fennel, red onion, preserved citrus with hazelnut dressing scored points. A beef stir-fry with egg noodles; and an unusual salted chicken salad with coconut shavings, dried mango and coconut dressing. Little jars aside, a few solid separate bits of protein would not have gone amiss – a few cocktail sausages perhaps? Melktert miniatures and farm nectarines finish it off. (The vegetarian picnic version is fairly similar, but the salads only have cheese, and a Med grilled vegetables replaces the beef noodle stir-fry). The kiddies’ option was the source of envy at our table of four. A box of homemade chicken nuggets and fries were still warm. We felt lucky when our son graciously shared bits of his chocolate brownie. ALLÉE BLEUE, Intersection R45 and R310, Franschhoek. Allée Bleue, 021-874-1021. Picnics: R185 per person for standard or vegetarian picnic. Includes two glasses of Allée Bleue Starlette Blanc per adult. 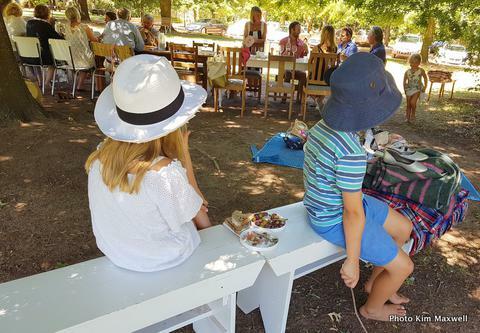 Kiddies’ picnics: R65 per child including a juice box. Herb tours (40 min) 10.30am on Fridays. 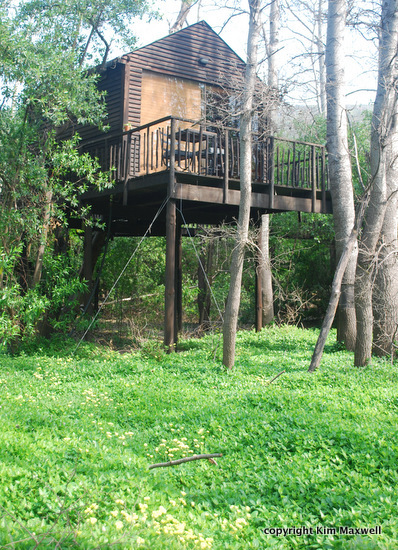 R185 per person including a welcome drink and three-course meal at Allée Bleue Bistro. 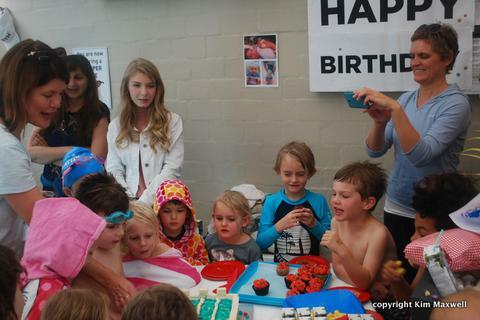 Daniel’s 5th birthday party fell on a public holiday again. 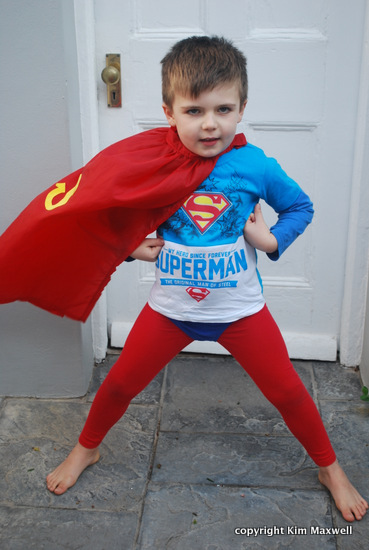 Five seems to be an age where kids love to show off their strength, lightning speed and superhuman powers. 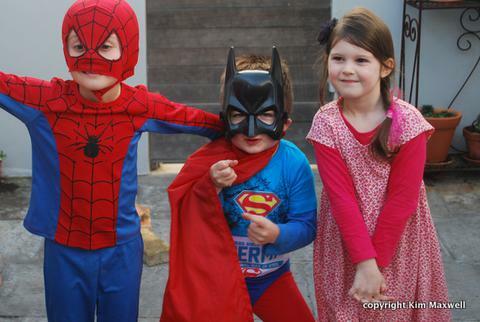 So naturally we had a superhero and pajama party (a few adults dressed up too, but swapped the spiderman mini-juices for wine). We usually get a bit carried away and invite too many people, but it was a little more hectic than normal this year. I’m working fulltime as an acting magazine editor for six weeks, so it meant I only had weekends to run around and source cake decorations and ingredients. 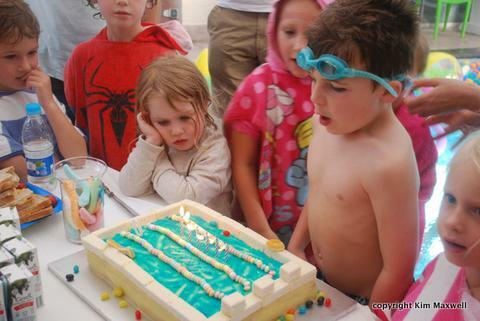 Then Craig’s flight was delayed for hours the day before while the house/cake/cupcakes/garden were meant to happen. No pressure. It’s why I wore a Wonder Woman T-shirt on the day and felt the part. I deviated from the usual beer box cake recipe because I was given a new Kitchen Aid cake tin with smaller dimensions (23 x 33 x 5cm) and wanted to put it to the test. 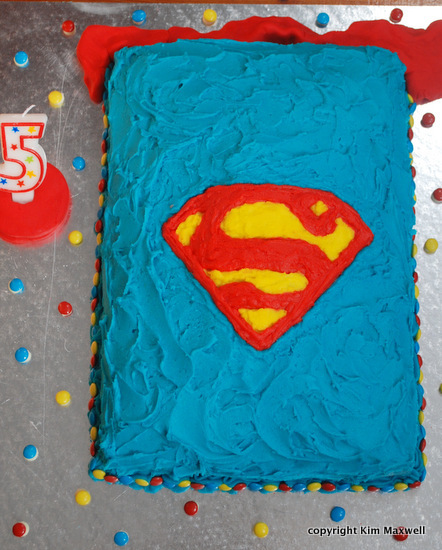 It made just the right size of cake to accommodate Clark Kent’s buffer alter ego. My cake rose too much in the centre, but I just piped butter icing in the cracks and kept spreading. 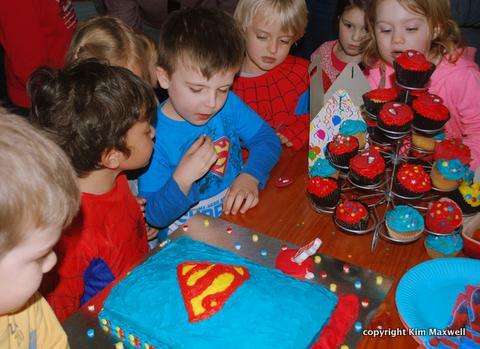 Fortunately Superman needed a puffy chest. Versatile and flop-proof, butter cake is the foundation for many recipes. 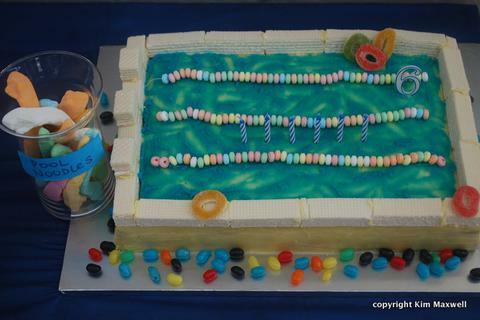 The cake batter is easily modified to include other ingredients and flavours. Preheat oven to 180°C. Grease 2 round 20 cm cake pans. Cream butter and sugar together. Add eggs, one at a time, beating well after each addition, until light and creamy. Add essence. Sift flour, baking powder and salt together. Add dry ingredients, alternately with milk, to egg mixture. Spoon mixture into the prepared pans and bake for about 25 minutes. Leave in pans for a few minutes before turning out onto a wire rack to cool completely. -Oil cake: Substitute butter with cooking oil. -Large tray bake cake: Double the recipe. Bake mixture in an oven pan of about 24 x 34 cm for 35 – 40 minutes. -Chocolate cake: Mix 60 ml (¼ cup) cocoa powder with 60 ml (¼ cup) warm water and add to the cake batter. Beat together butter and icing sugar until soft. Beat in the milk and lemon juice. Add colouring. 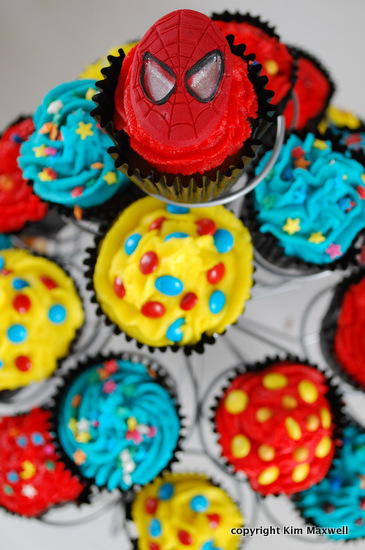 Tip: buy cake decorations and ingredients, including bottled red, yellow and blue gel food colouring, Spiderman cupcake icing faces, and catering packs of smarties (sort them into red, yellow and blue colours) at CAB Foods. Bread & Butter. Stephen and Eileen Cross’s passion for baking (all self-taught) put a suburban tea room on the map. 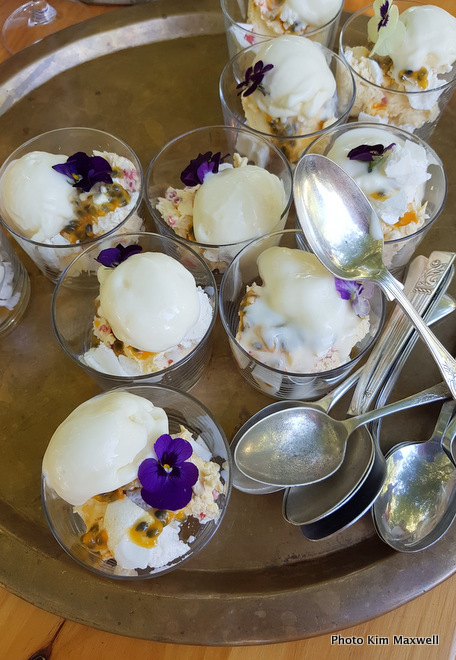 Their tea lover’s menu includes a loose tea selection, while a display table is filled with Amarula carrot cake to daintily decorated lemon meringue cupcakes with curd centres on cupcake bases. Five types of cheesecake include Oreo, red velvet and caramel chocolate. They’re also known for Banting sweet treats. Sandown Road, Sunningdale. 021-554-5817. Four & Twenty Café. 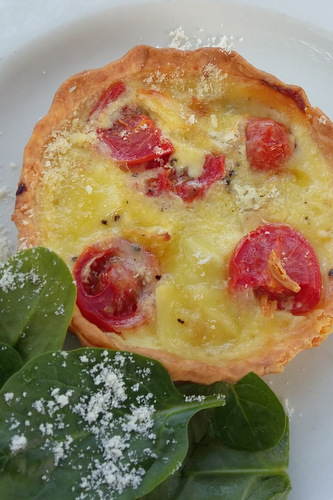 Silwood-trained Tracy-Leigh Genricks’s display of hand-crafted pastries, biscuits, tarts and cakes are innovative, delicious and a treat to look at. Staples include scones, cheesecake, and fruit-filled tartlets – always with a new flavour, topping or twist. Try decadent chocolate ganache cupcakes to meringue, lime and strawberry pies. La Belle Bakery. 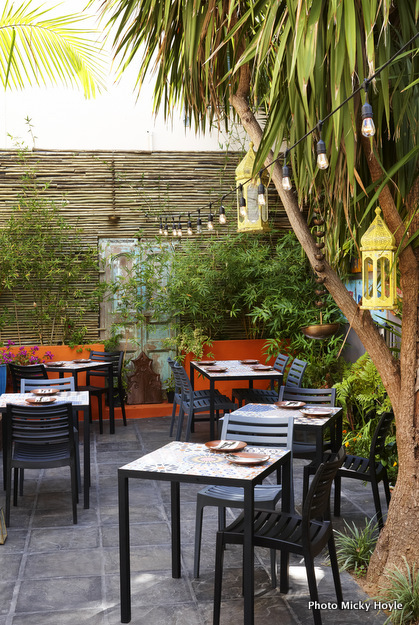 A cosy interior and terrace is a popular option in this leafy neighbourhood where Ronnefeldt teas are served. Tag on a meander down the adjacent Alphen Trail afterwards. A pastry chef’s display entices with lemon bars to baked cheesecake, rocky road squares or coconut and pineapple mini carrot cakes. The Alphen hotel, Constantia. 021-795-6336. M Patisserie. 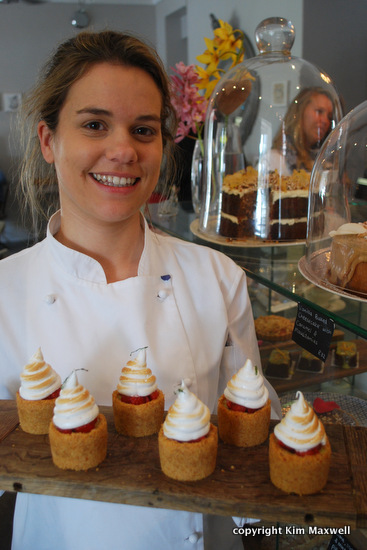 Self-trained and extremely talented, Martjie Malan sets the standard in Cape French-style patisserie. 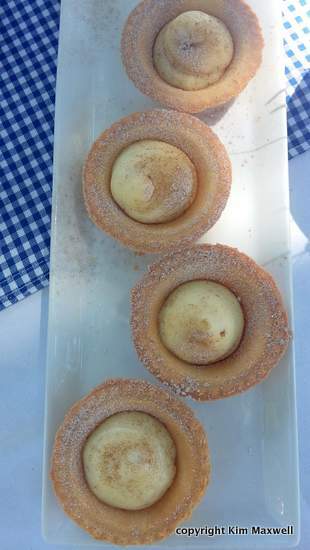 This Koekedoor TV show finalist epitomises baking precision and perfection. 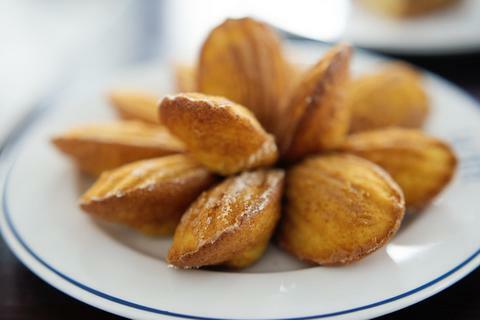 She’s the queen of macarons, sweet or savoury eclairs, and madeleines made the classic way. 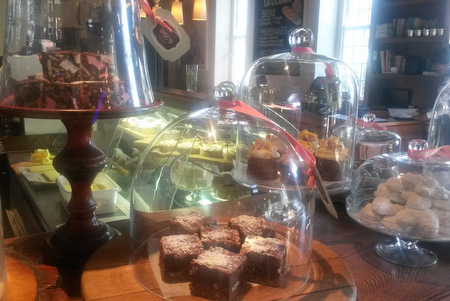 Visit her venue to enjoy exquisite cakes with Nigiro’s loose-leaf teas. Andringa Street, Stellenbosch. 021-886-5020. The Birdcage. Institute of Culinary Arts-trained baker Beate Strydom says red velvet cupcakes put this tearoom on the map, but she prefers making more interesting, newer creations including brown sugar cupcakes with butterscotch centres. 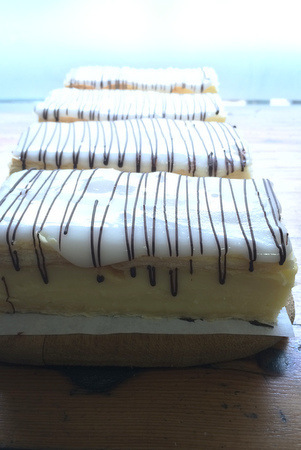 The people’s favourite, this tea room offers Dilmar teas, custard and chocolate bars, cheesecakes (always baked), and even nougat studded with Jelly Tots.